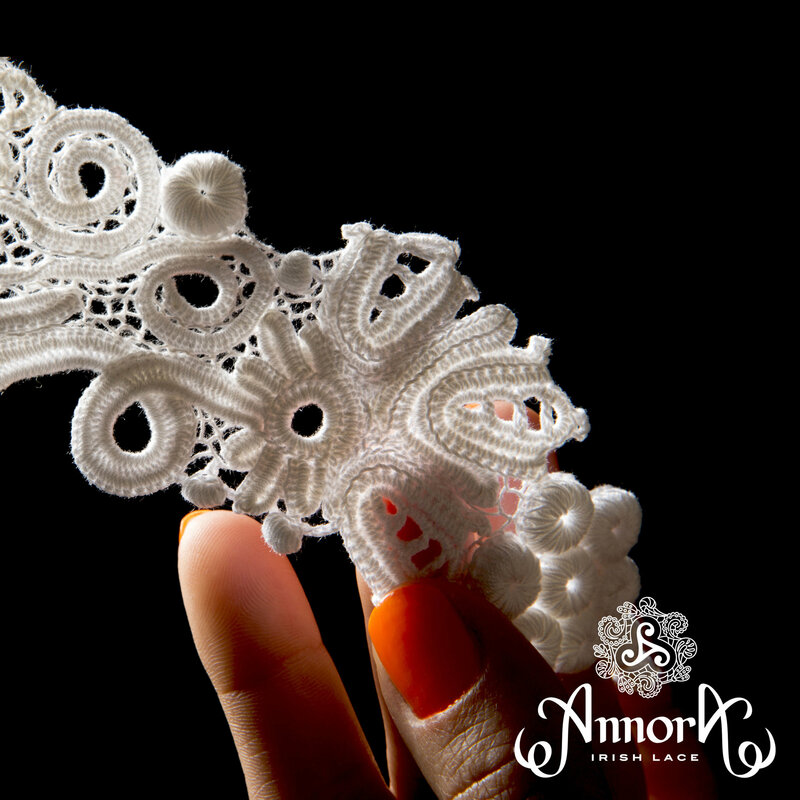 21.5 cm x 6 cm at the widest lace part. 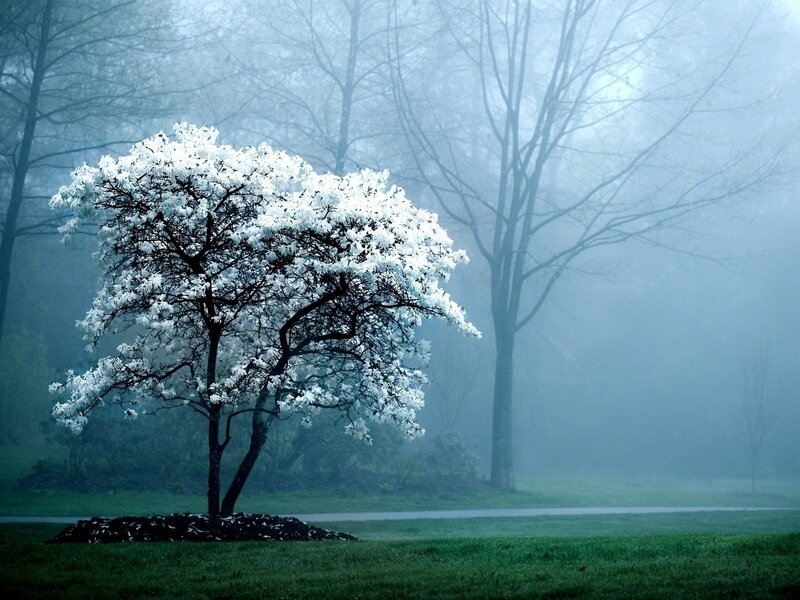 Material: 100 % double mercerized cotton. 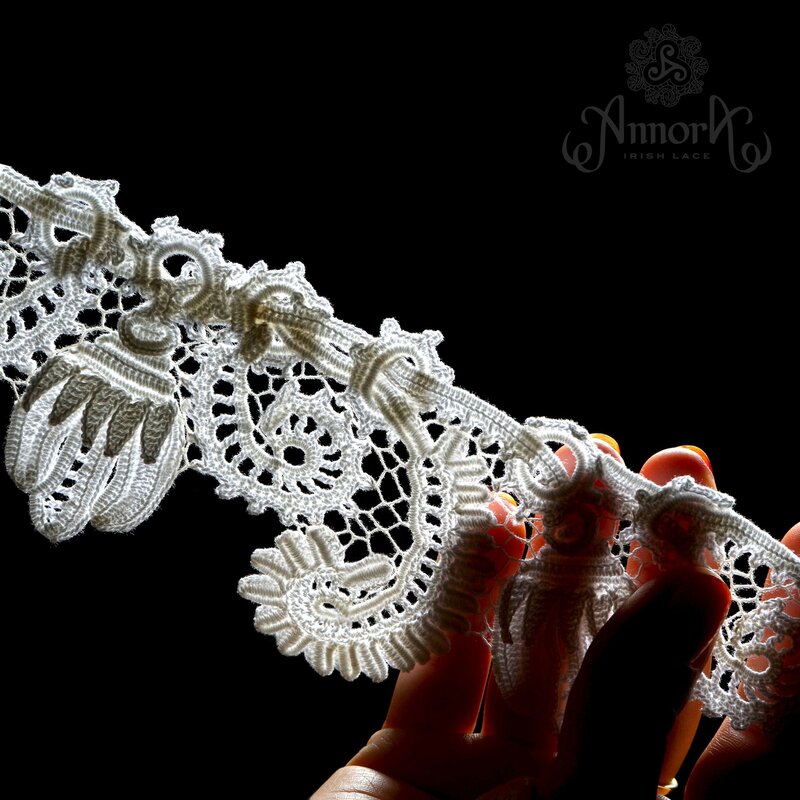 patterns: length of 1 g yarn is 11.5 m.
bridges: length of 1 g yarn is 18 m.
Technique: entirely handmade, bridges made with needles. 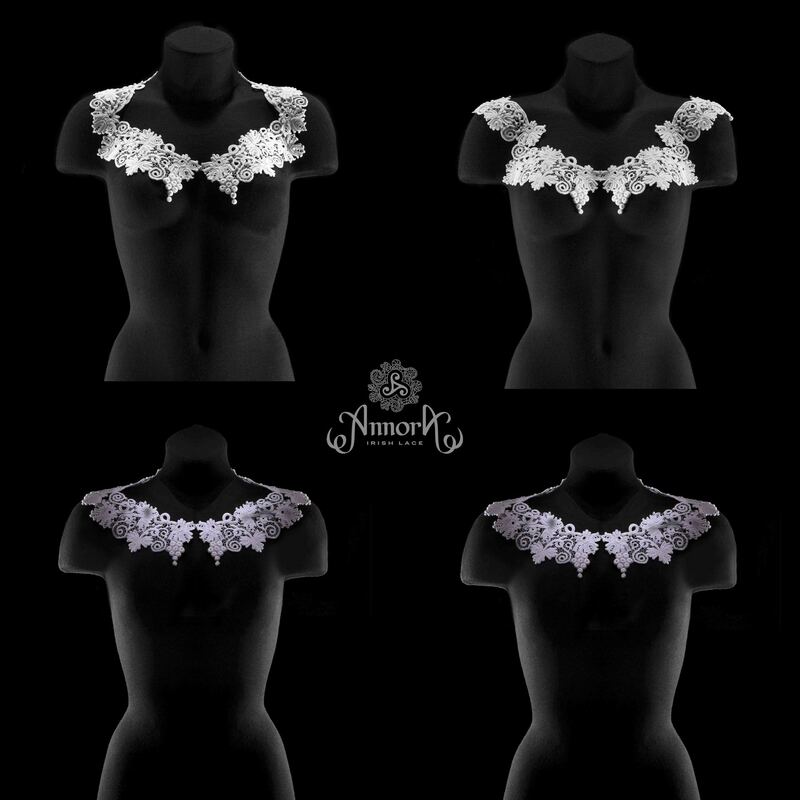 Our designer can offer you to create 8 looks with this set: 5 collar options for a Victoria-neckline or not-deep V-neck, 2 boat shaped neck option, 1 stand collar options. 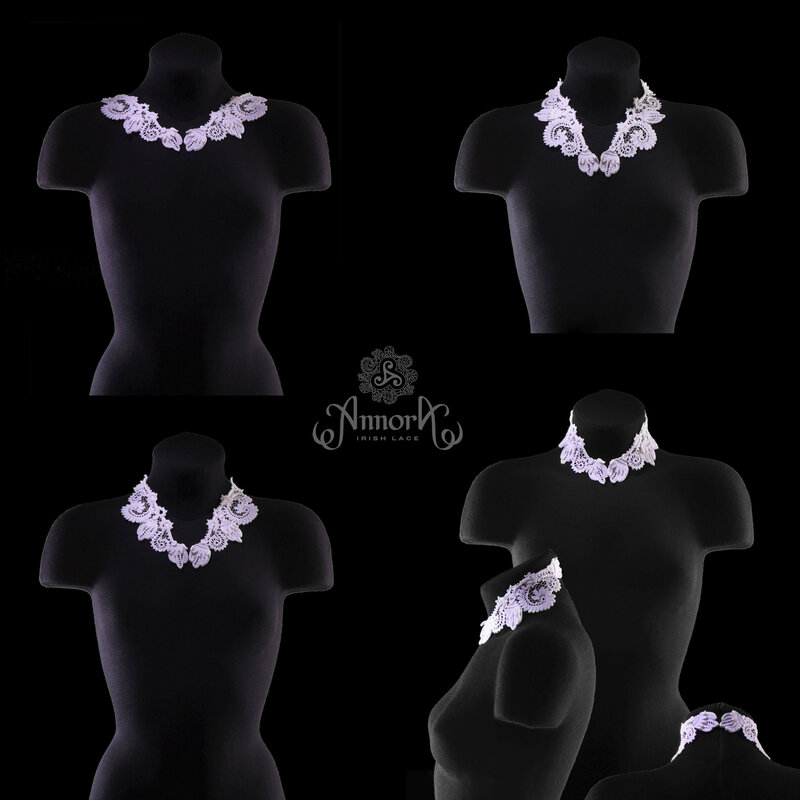 A small elegant collar with an exquisite oriental ornamental script with flower buds and fantastic leaves will suit refined natures with a delicate taste. 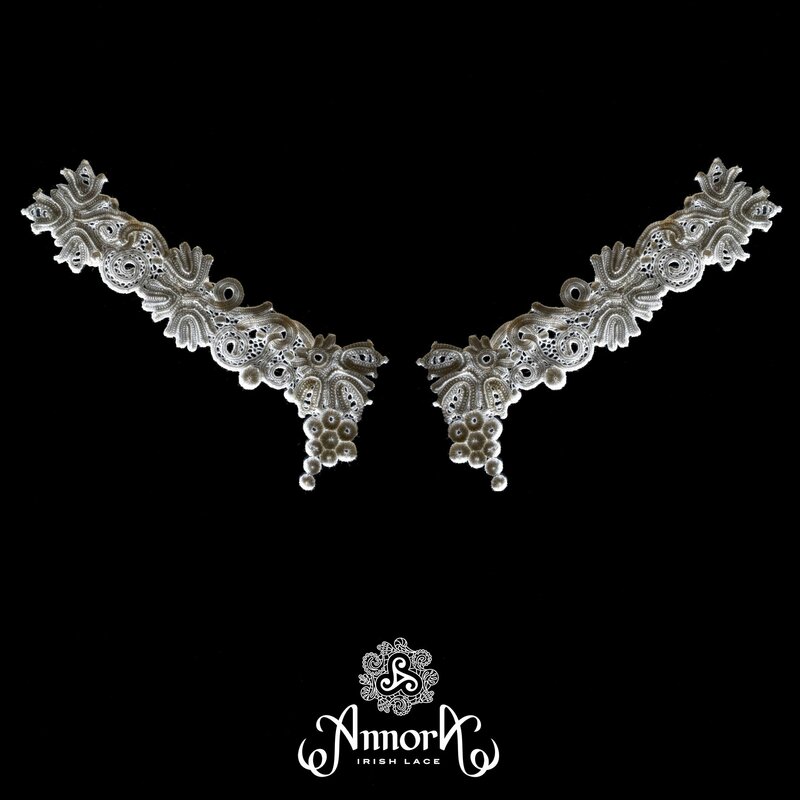 This collar can be used as cuffs in complete set with the «Saffron»-collar. 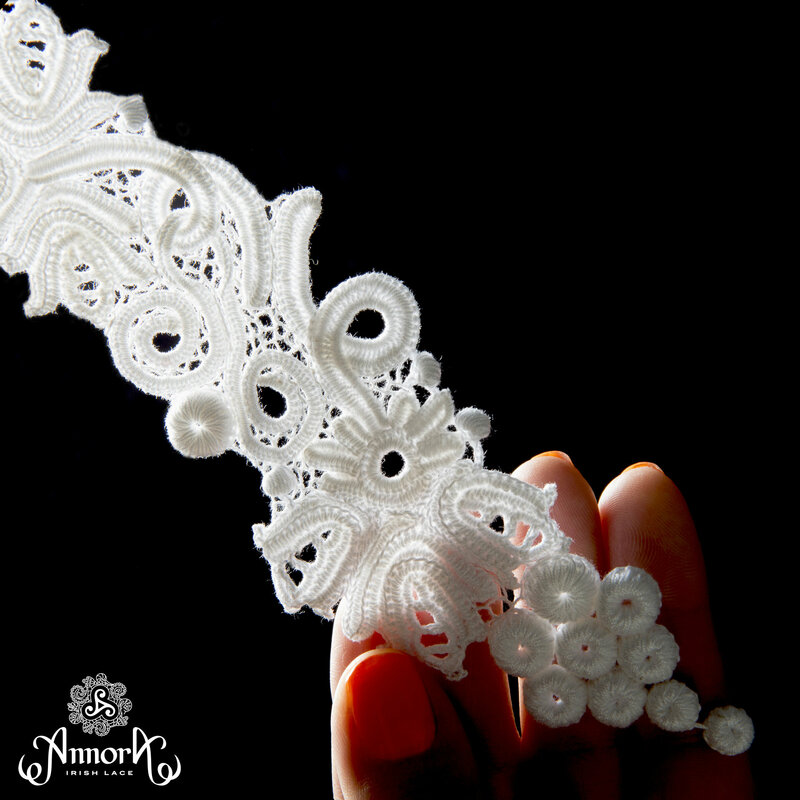 19 cm x 4,5 cm at the widest lace part. 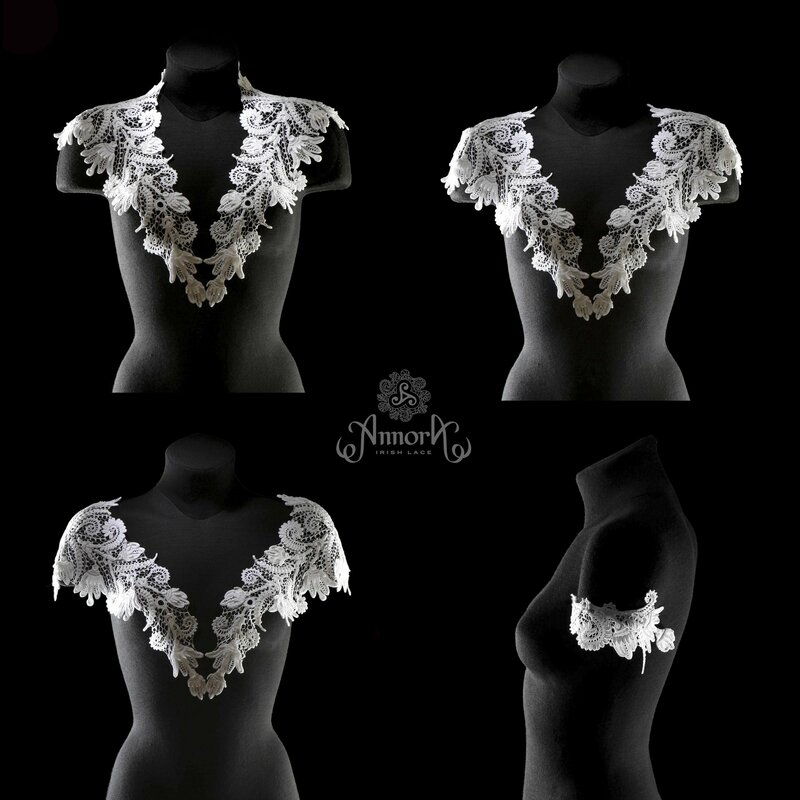 Our designer can offer you to create 3 looks with this set: 2 collar options for a Victoria-neckline or not-deep V-neck, 1 stand collar options. 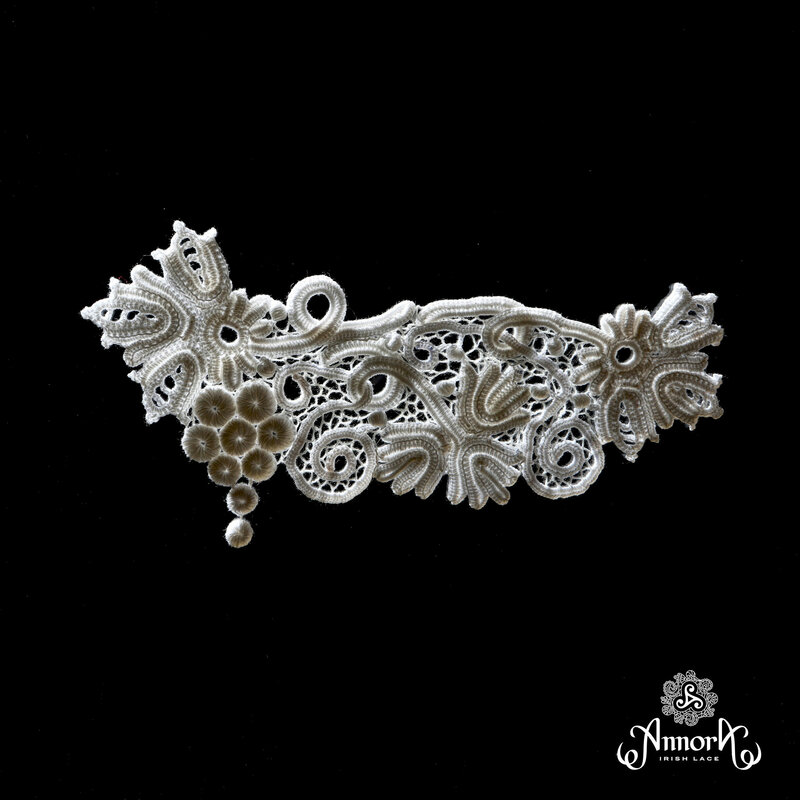 A small collar with a flowery matting of grape vine which symbolizes fertility, passion, plasticity and sophisticated power of a woman. 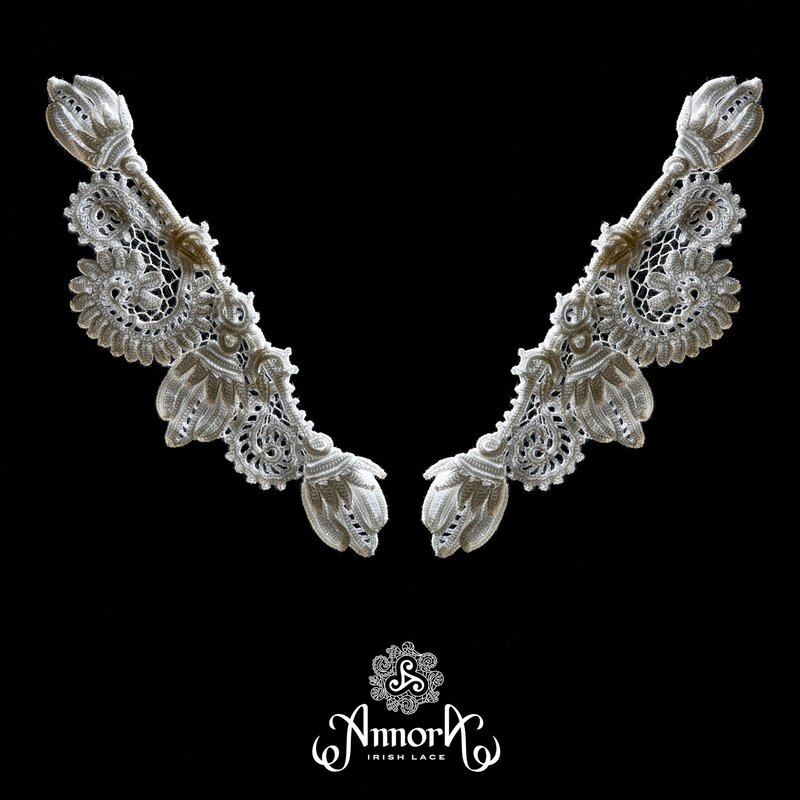 This collar can be used as cuffs in complete set with the «Grape»-collar. 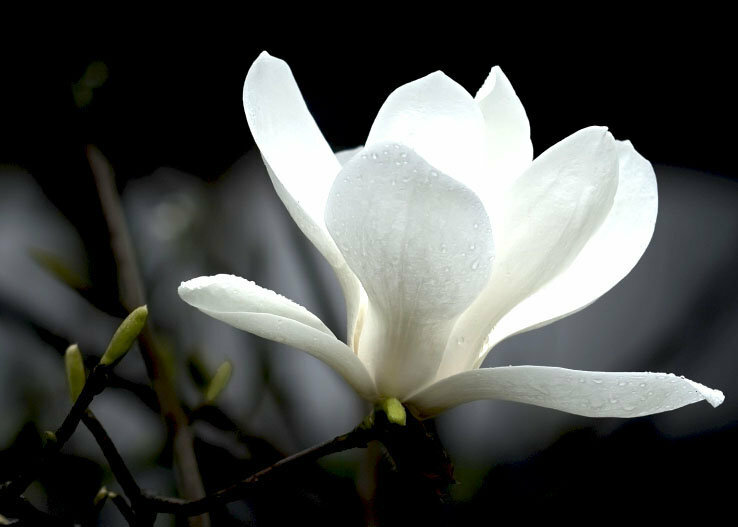 Technique: entirely handmade, bridges made with needles, , Clones-slubs. 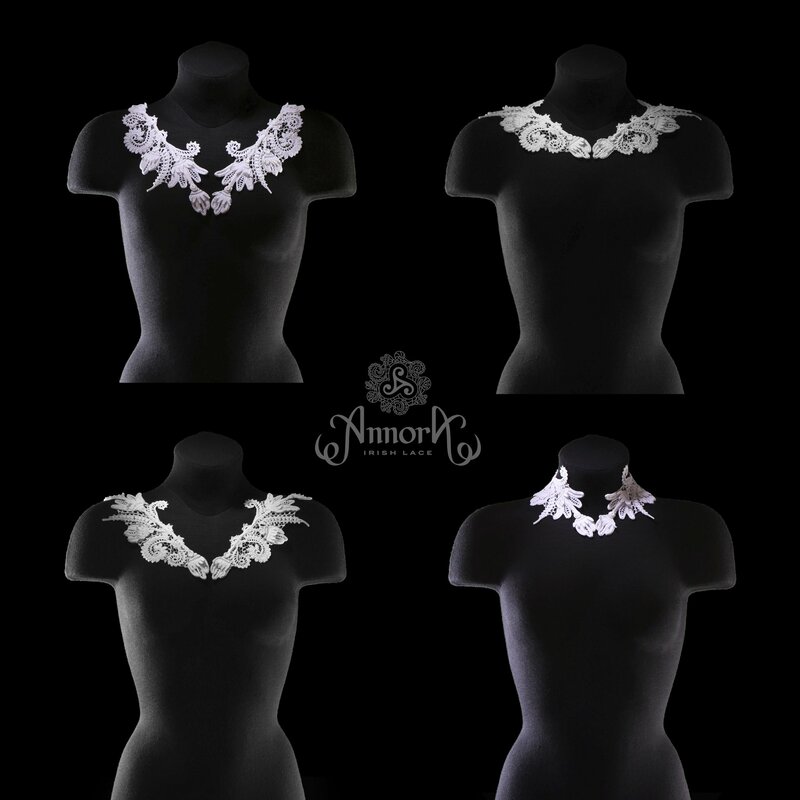 Our designer can offer you to create 3 looks with this set: 2 jewelry neckline options and 1 stand collar options. 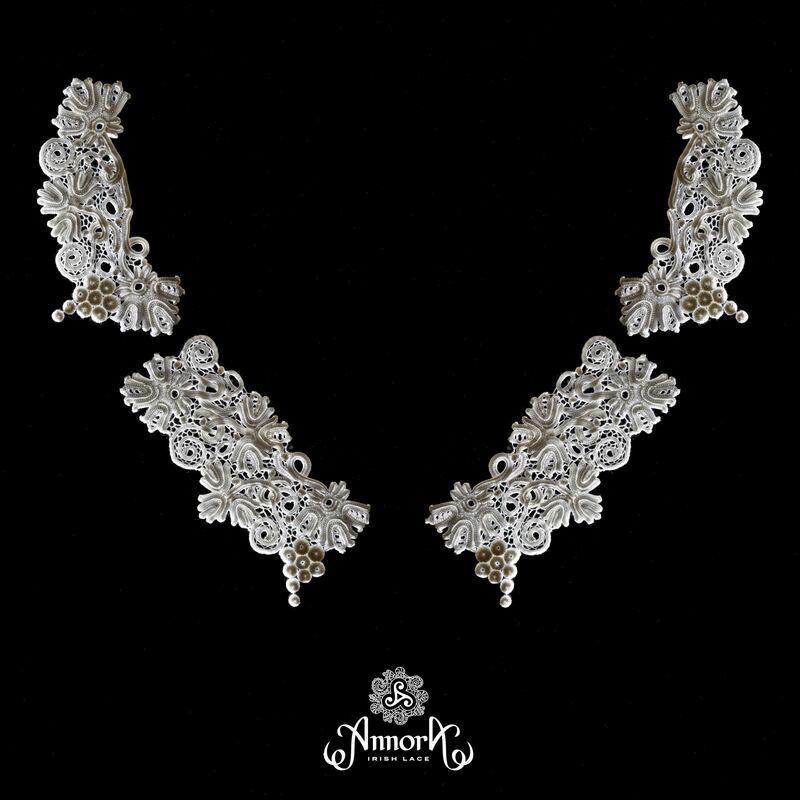 An exquisite collar with bunches of grapes, an ancient symbol of fertility, sufficiency, richness and vitality. 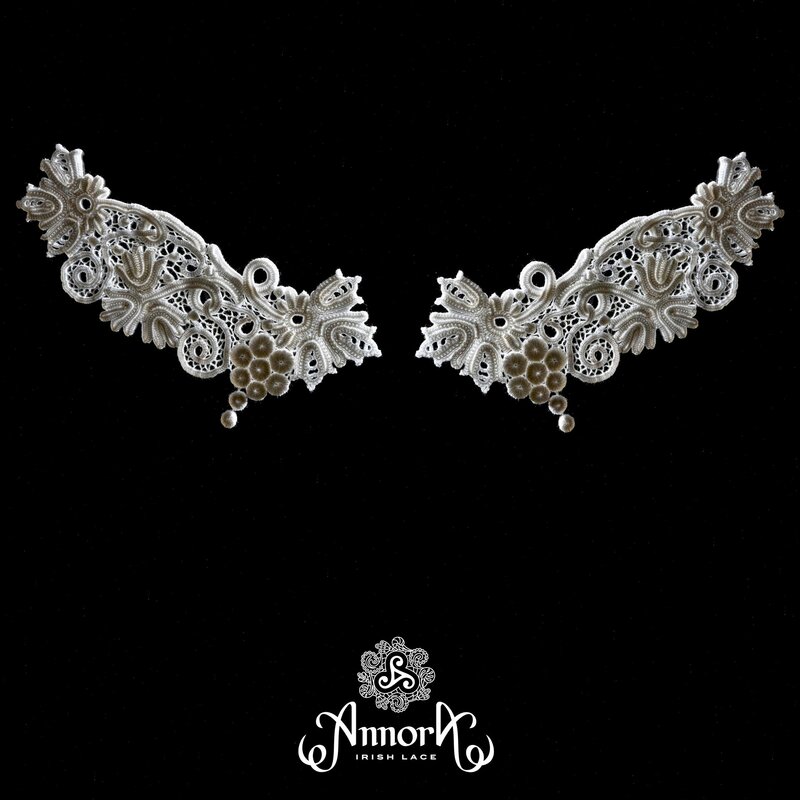 This collar can be used as cuffs in complete set with the «Grapes Viognier» and «Grapes Montils»-collars. 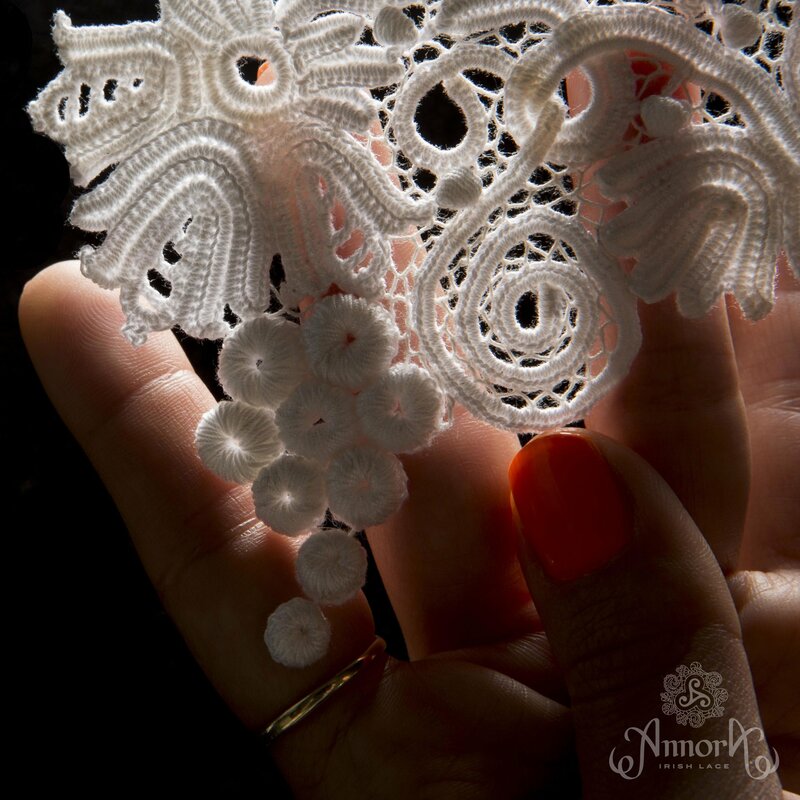 15 cm x 10 cm at the widest lace part. 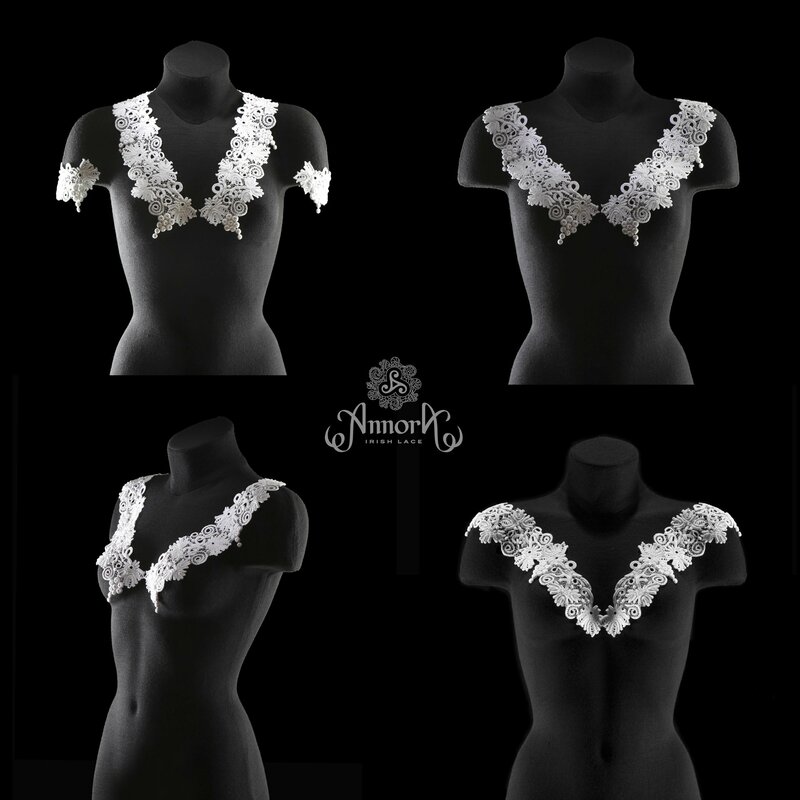 Our designer can offer you to create 7 looks with this set: 3 collar options for a Victoria-neckline or not-deep V-neck, 1 boat shaped neck option, 3 options for stand collar. 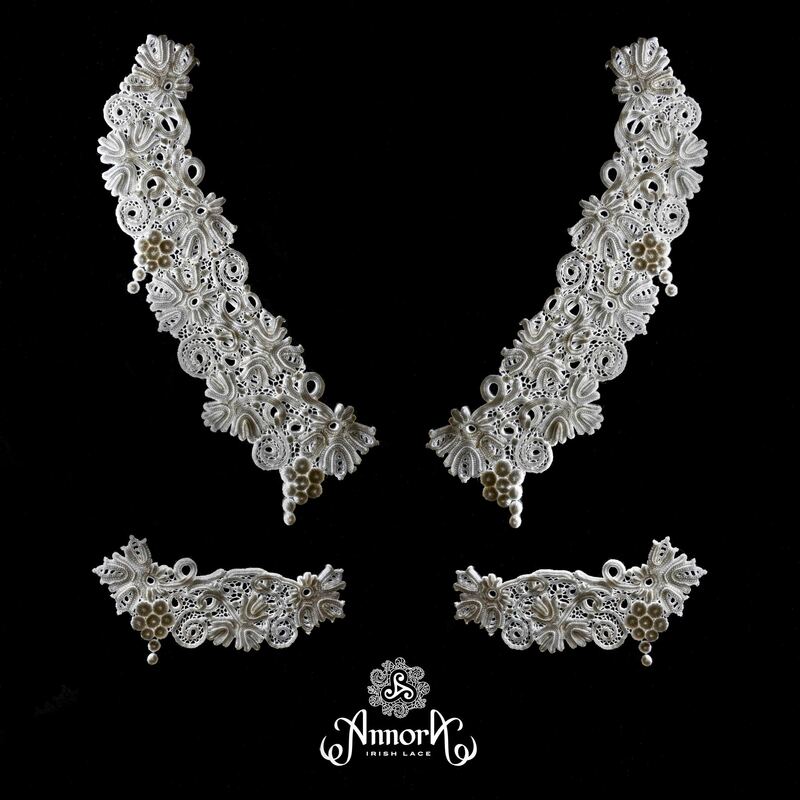 This collar can be used as cuffs in complete set with the «Berta»-collar. 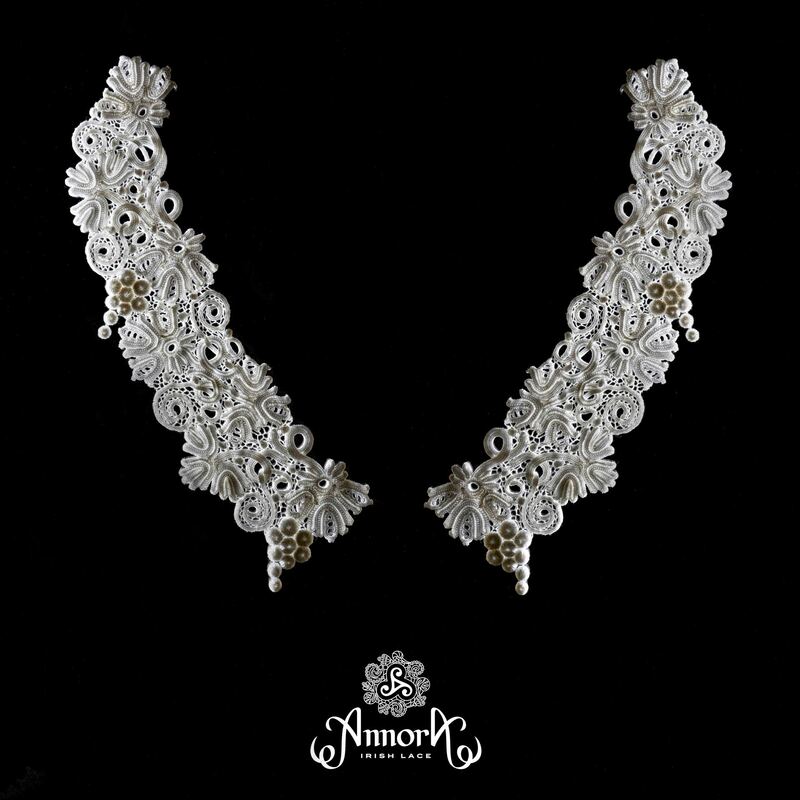 Collar -35 cm x 7cm at the widest lace part. 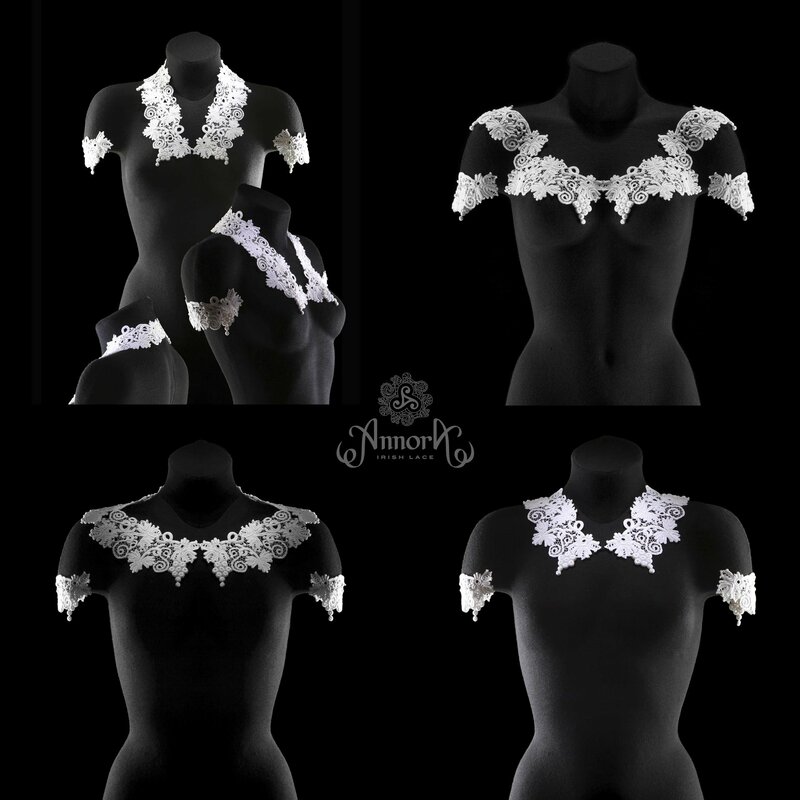 Our designer can offer you to create 4 looks with this set: 2 collar options for a Victoria-neckline or not-deep V-neck, 1 boat shaped neck option and 1 option for stand collar. 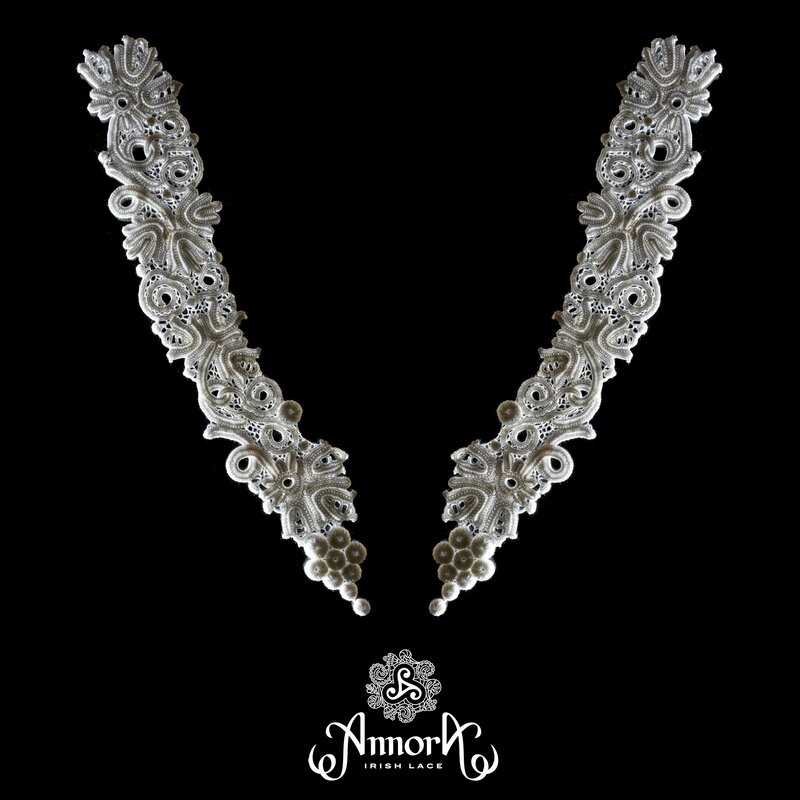 An elegant collar with an exquisite oriental ornamental script with flower buds and fantastic leaves will suit refined natures with a delicate taste. 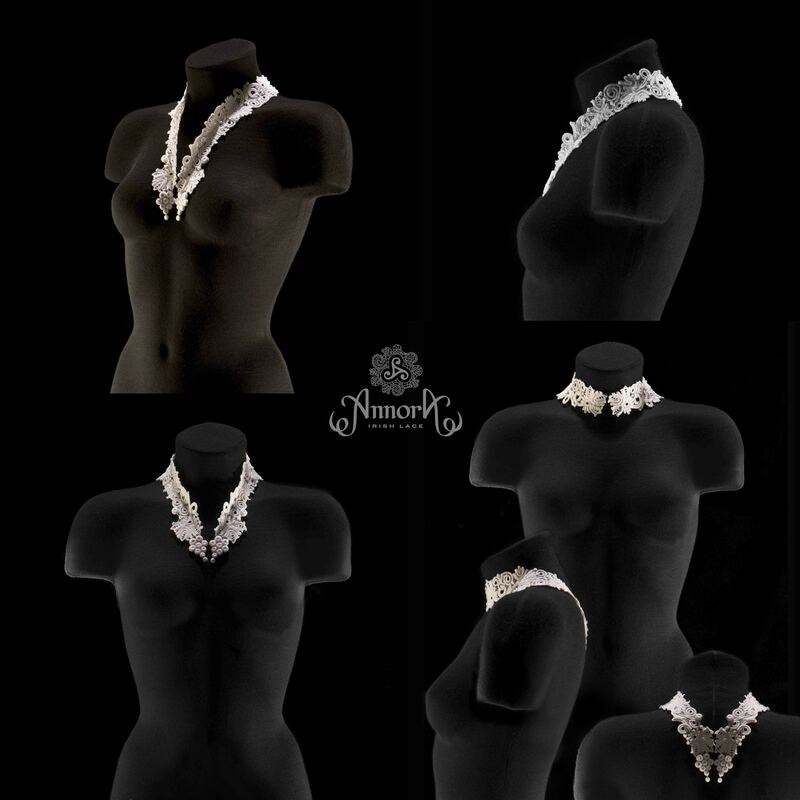 Set of this collar includes Buds-cuffs which can be used as a collar. 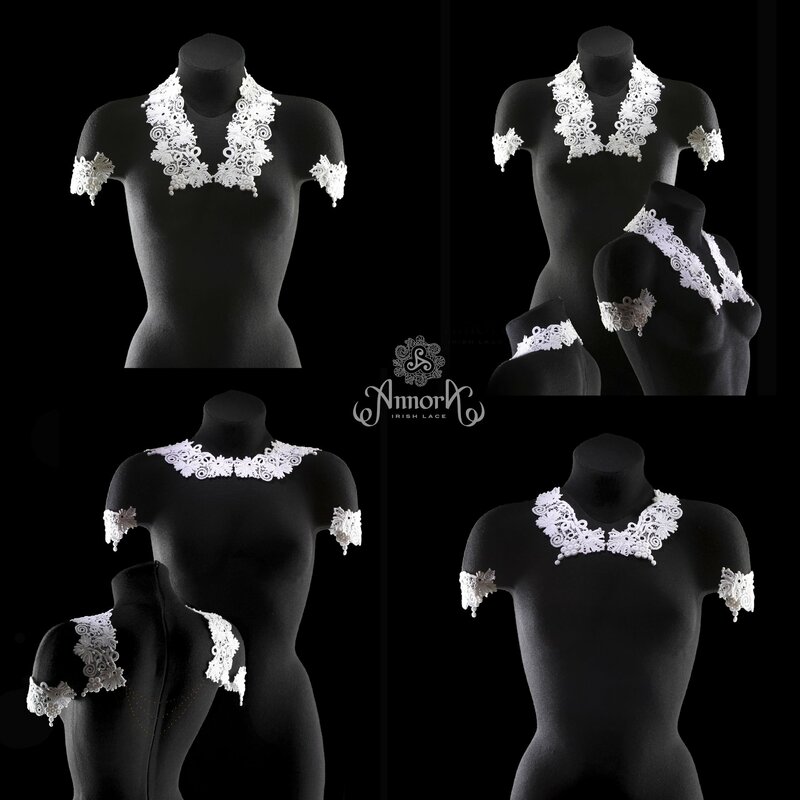 Our designer can offer you to create 3 looks with this set: 2 collar options for a Victoria-neckline or not-deep V-neck and 1 option for stand collar. 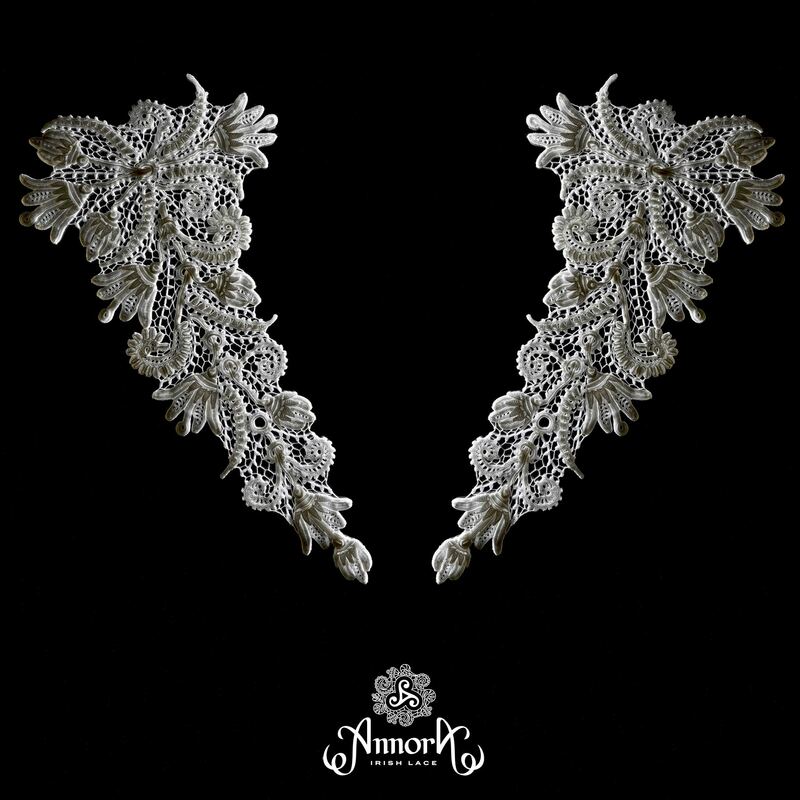 Set of this collar includes Vine - cuffs which can be used as a collar. 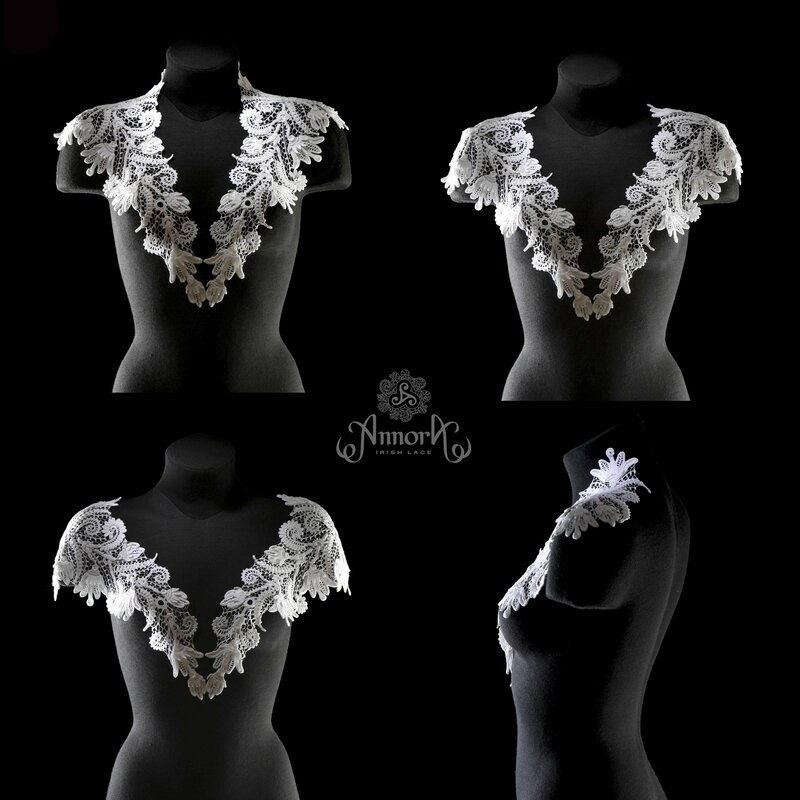 Our designer can offer you to create 5 looks with this set: 1 collar options for a Victoria-neckline or not-deep V-neck, 2 deep V-neck options, 1 boat shaped neck option, 1 jewelry neckline options. 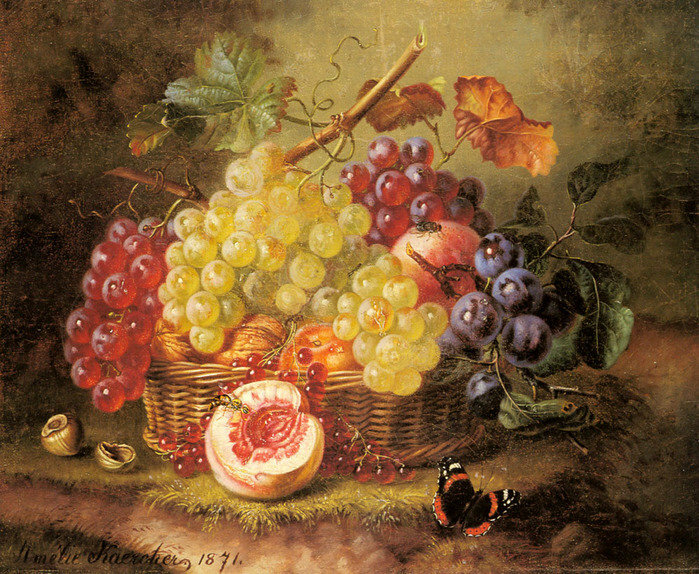 Viognier is a rare white grape variety used for production of fine wines. 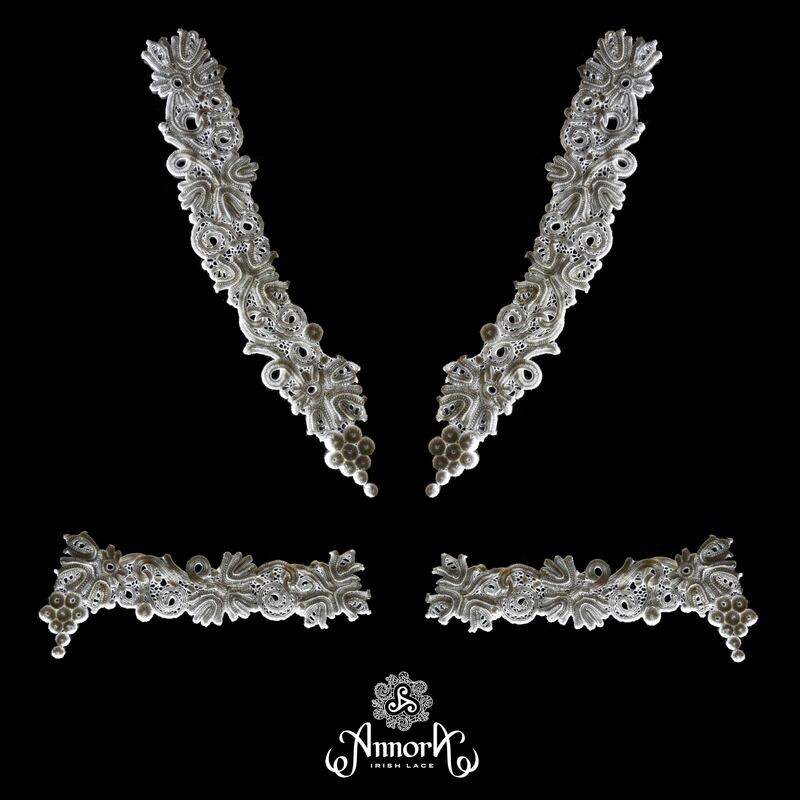 Set of this collar includes «Cluster of grapes» - cuffs which can be used as a collar. 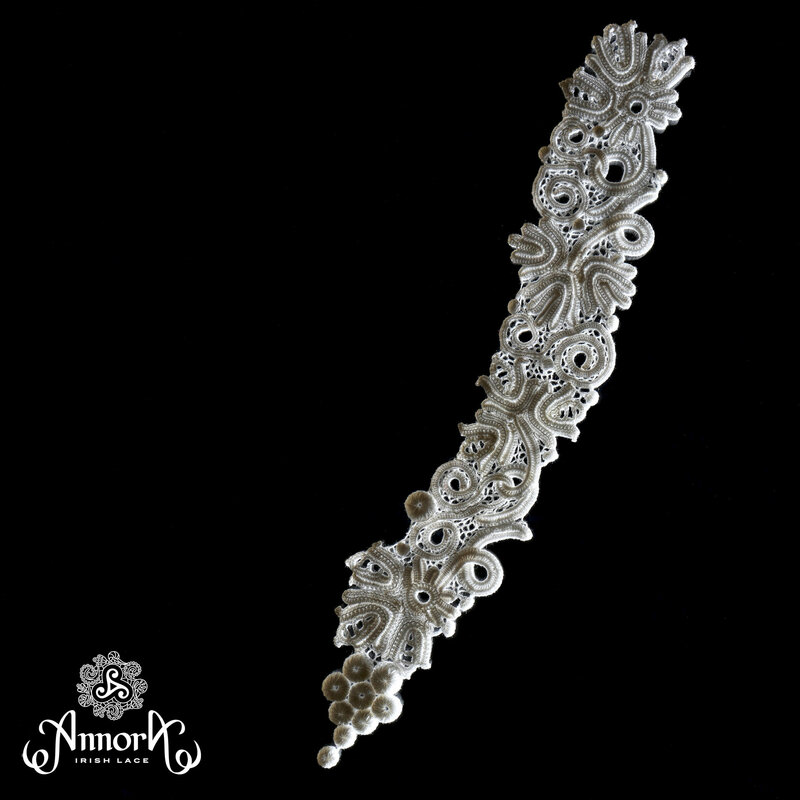 Technique: entirely handmade, Clones-slubs, bridges made with needles. 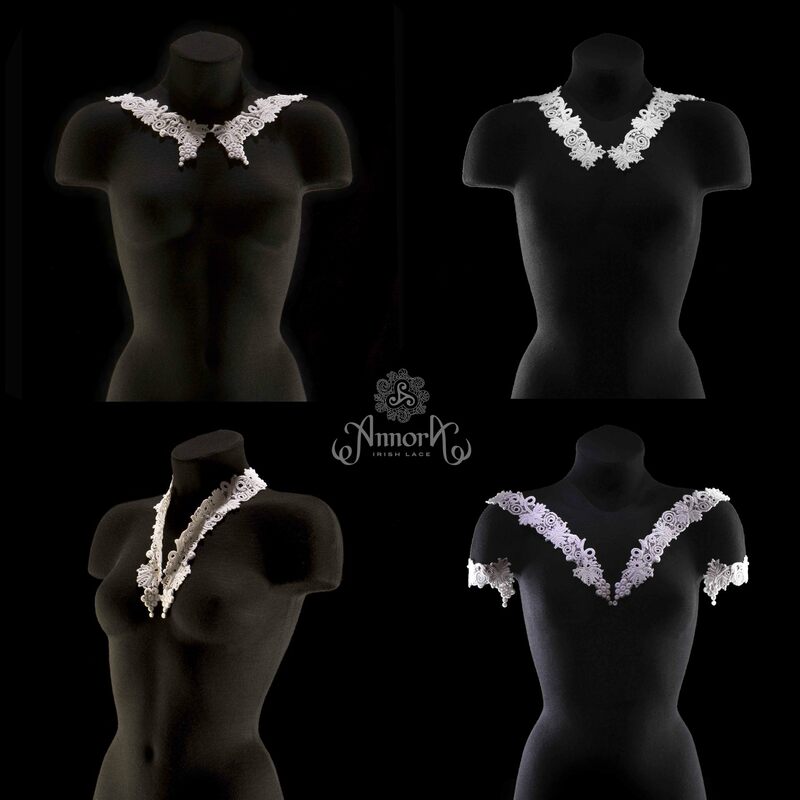 4 deep V-neck options, 2 collar options for a Victoria-neckline or not-deep V-neck, 1 boat shaped neck option, 4 closed collar options, 2 closed V-neck options, 3 sweetheart neckline options, 2 jewelry neckline options and 1 U-neck option. 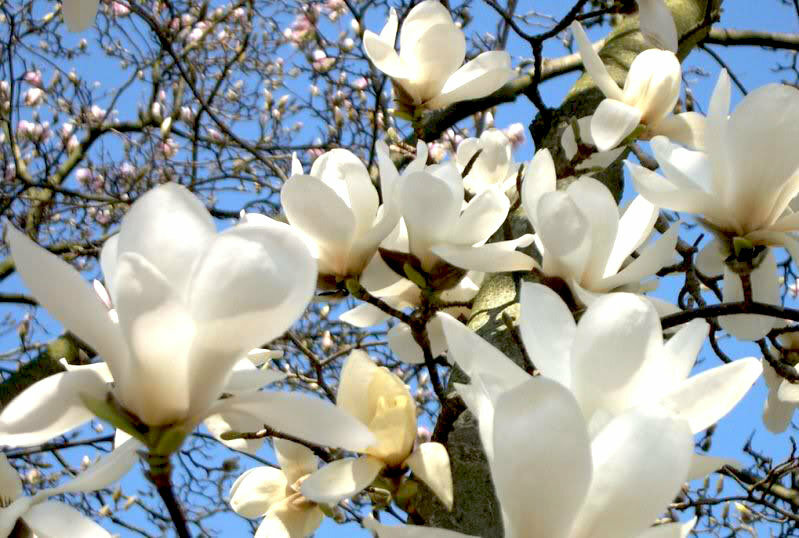 Montils is a white grape variety which lends a refined taste to expensive cognacs. 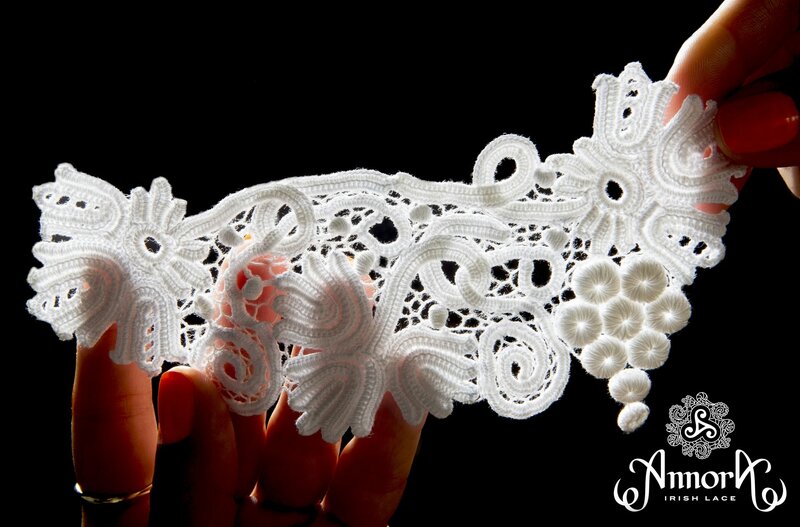 44 cm x 21 cm at the widest lace part. 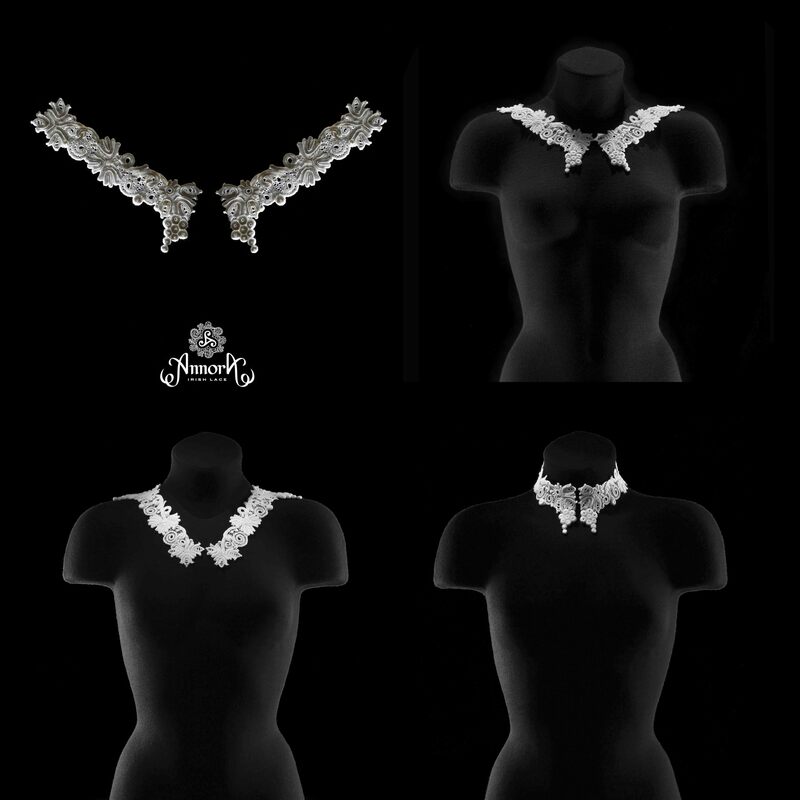 Berta-collar came into fashion in the Victorian era and then became a part of women’s wardrobe again in the 40-ies of the 20th century. 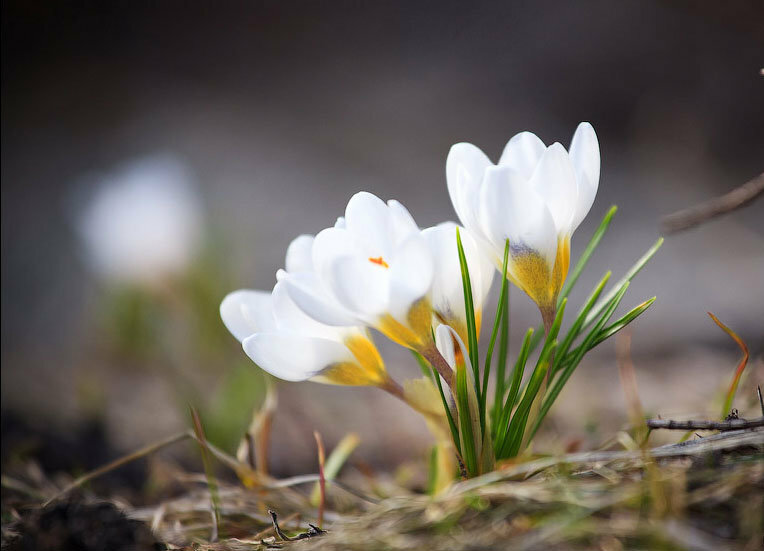 This is a wide flat soft semi-circular collar, located on shoulders and often with the shape of a boat. 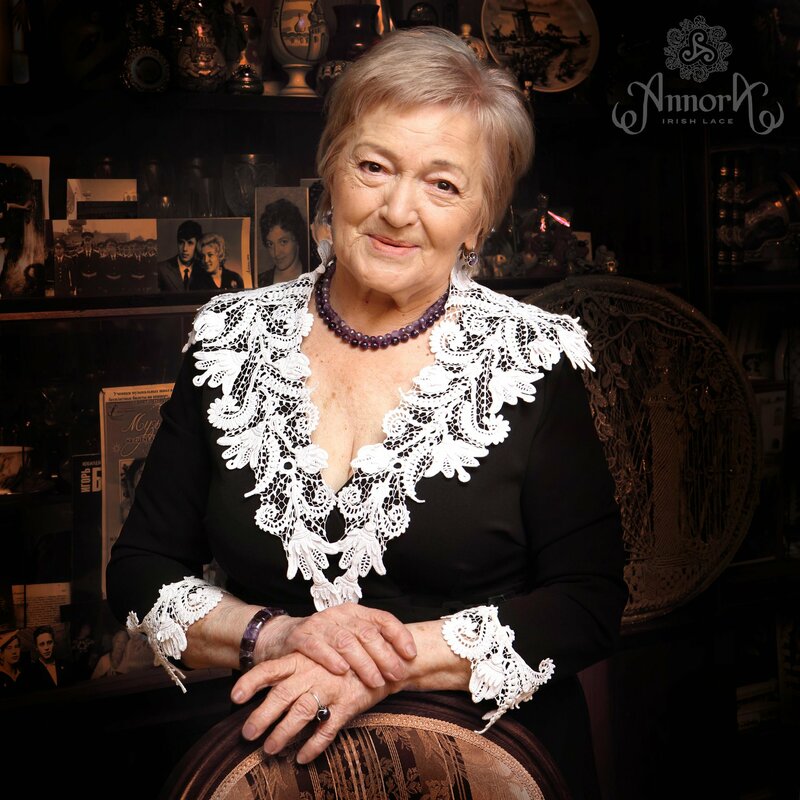 The collar width brings attention to the chest area, but is enough to cover it. 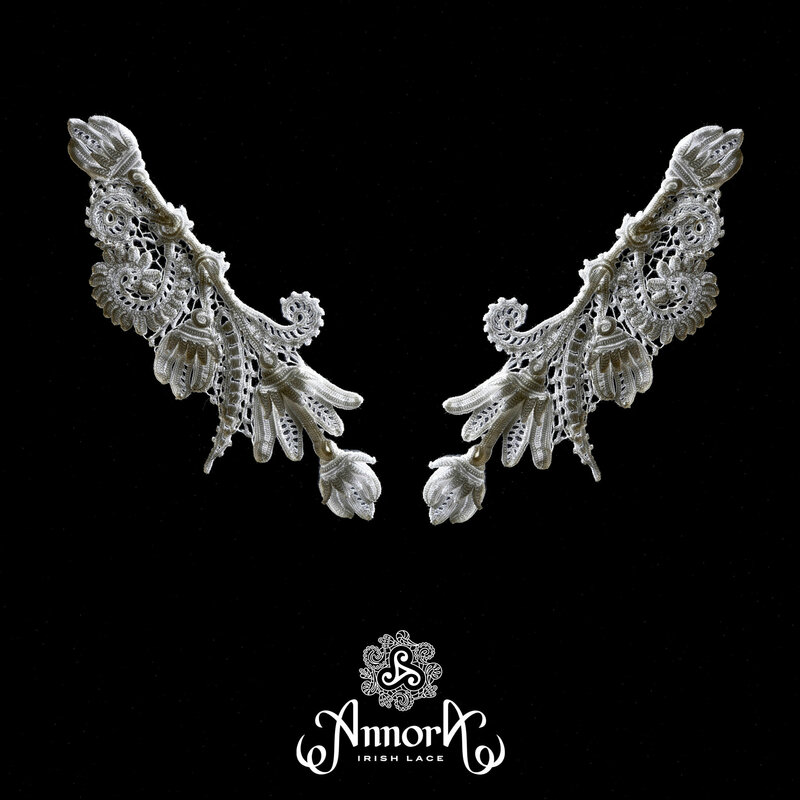 Set of this collar includes «Magnolias» - cuffs which can be used as a collar. 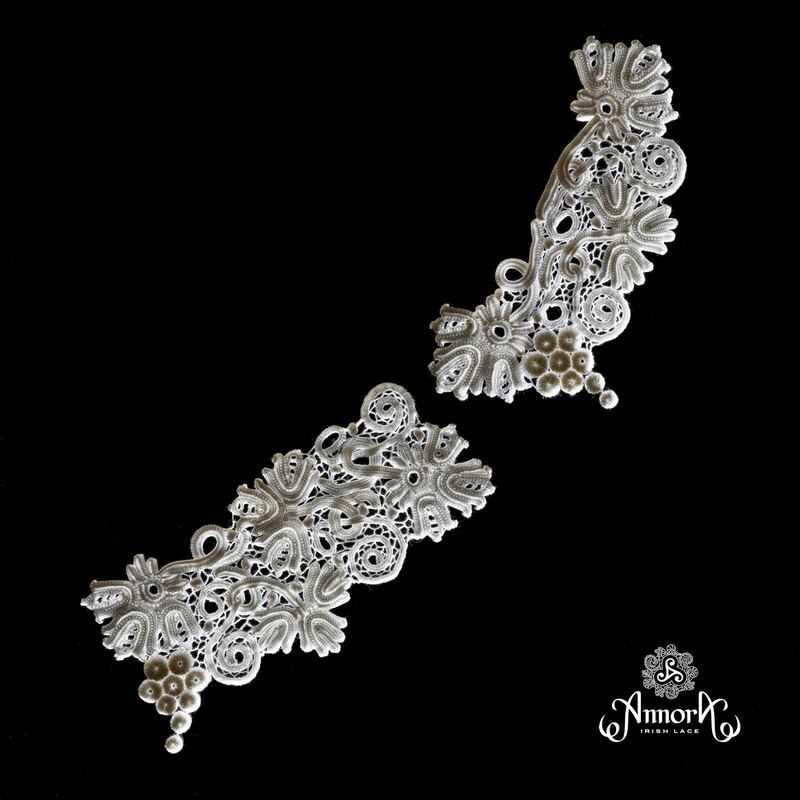 Technique: entirely handmade, Clones - bridges made with needles. 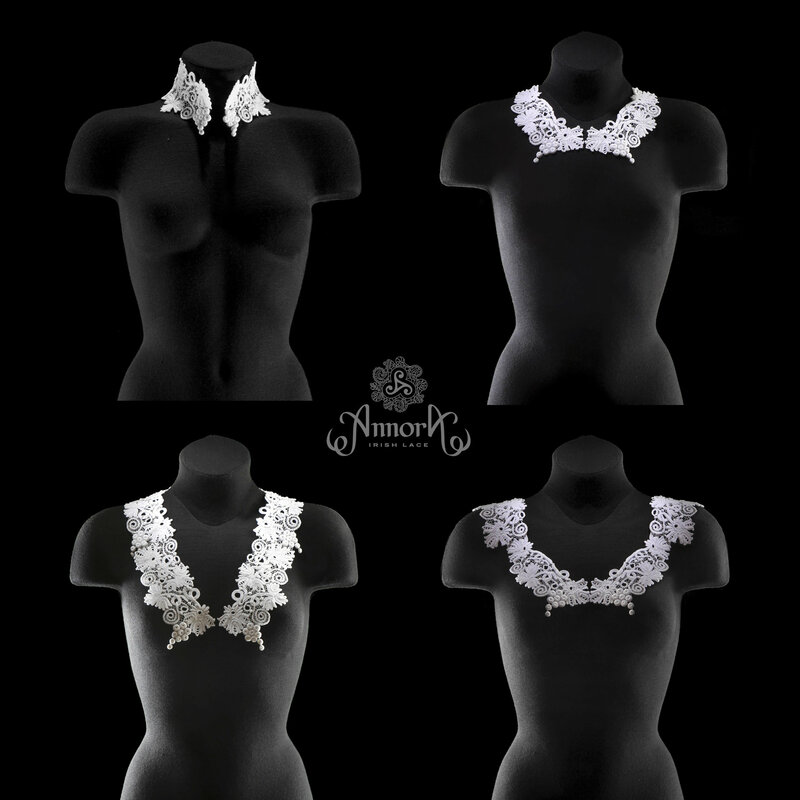 2 deep V-neck options, 5 collar options for a Victoria-neckline or not-deep V-neck, 3 boat shaped neck option and 2 option for stand collar. 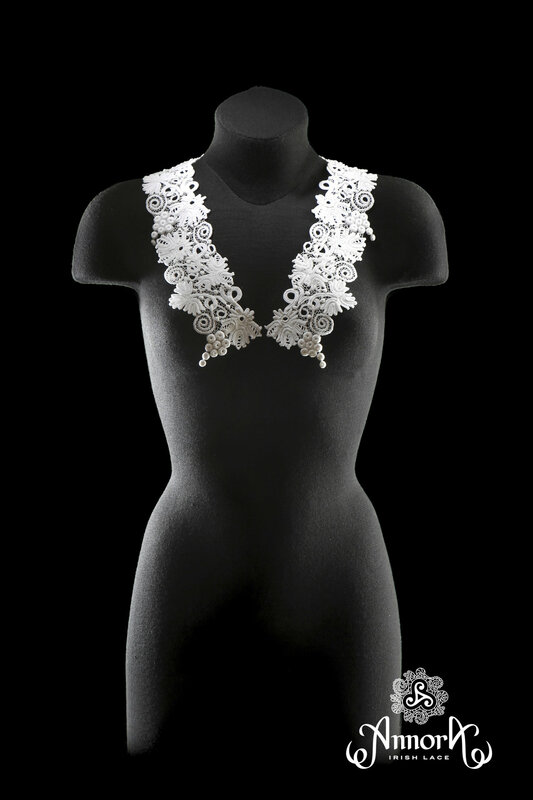 Set includes Saffron-collar and Buds-cuffs which can be used as a collar. 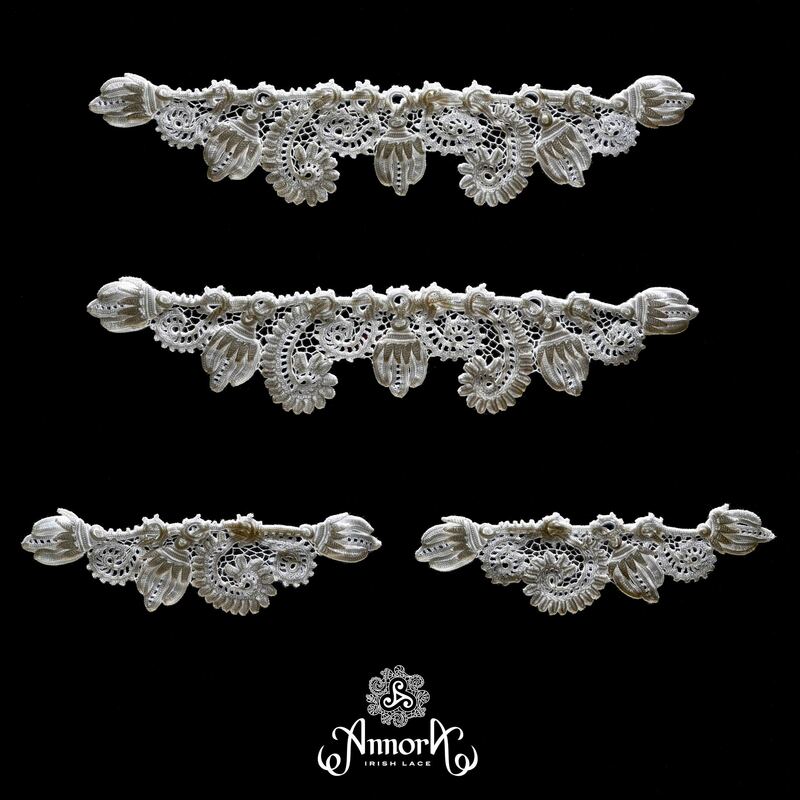 This elegant set with an exquisite oriental ornamental script with flower buds and fantastic leaves will suit refined natures with a delicate taste. 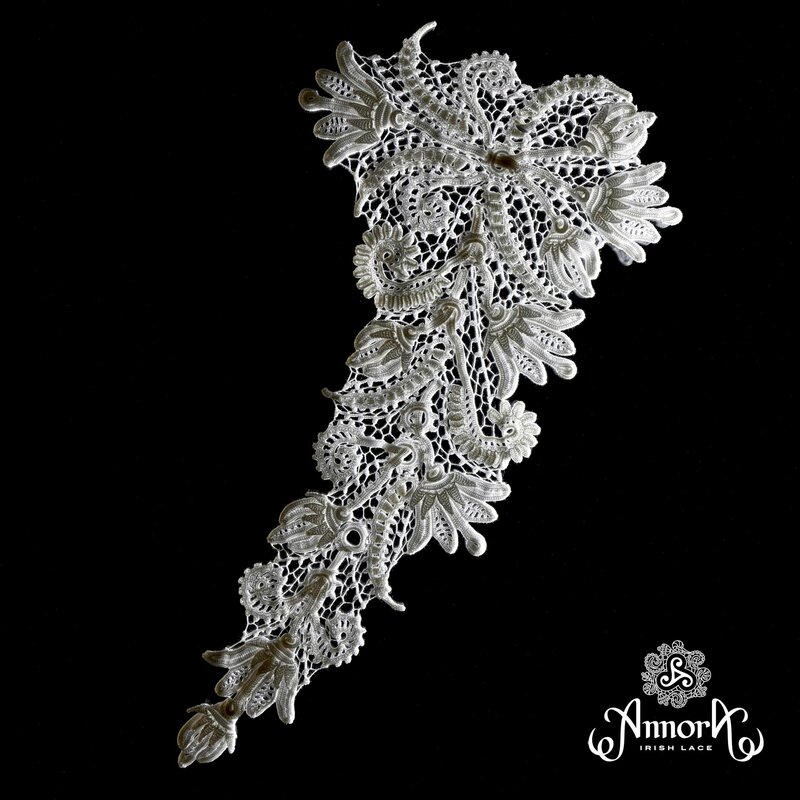 Collar - 27 cm x 5 cm at the widest lace part. 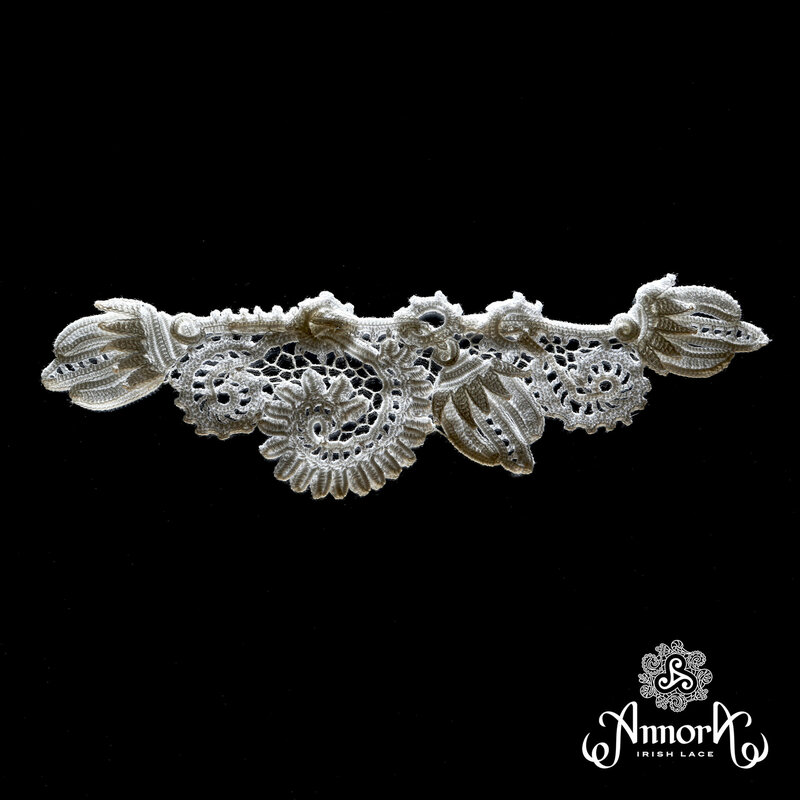 Cuffs – 19 cm x 4.5 cm at the widest lace part. Technique: entirely handmade, Clones-clubs, bridges made with needles. 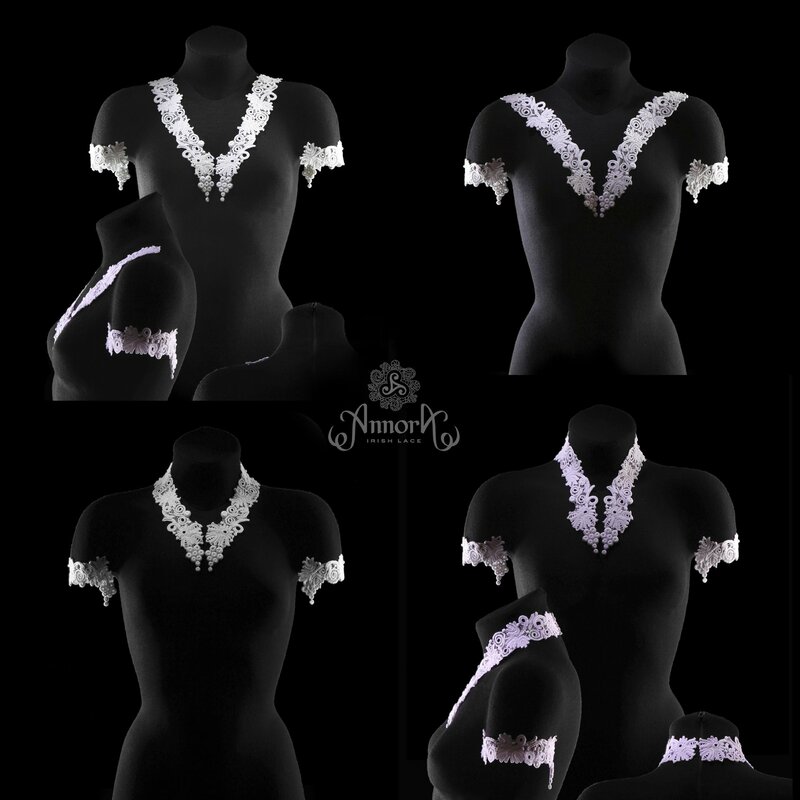 2 deep V-neck stand options, 6 collar options for a Victoria-neckline or not-deep V-neck, 1 boat shaped neck option and 1option for stand collar. 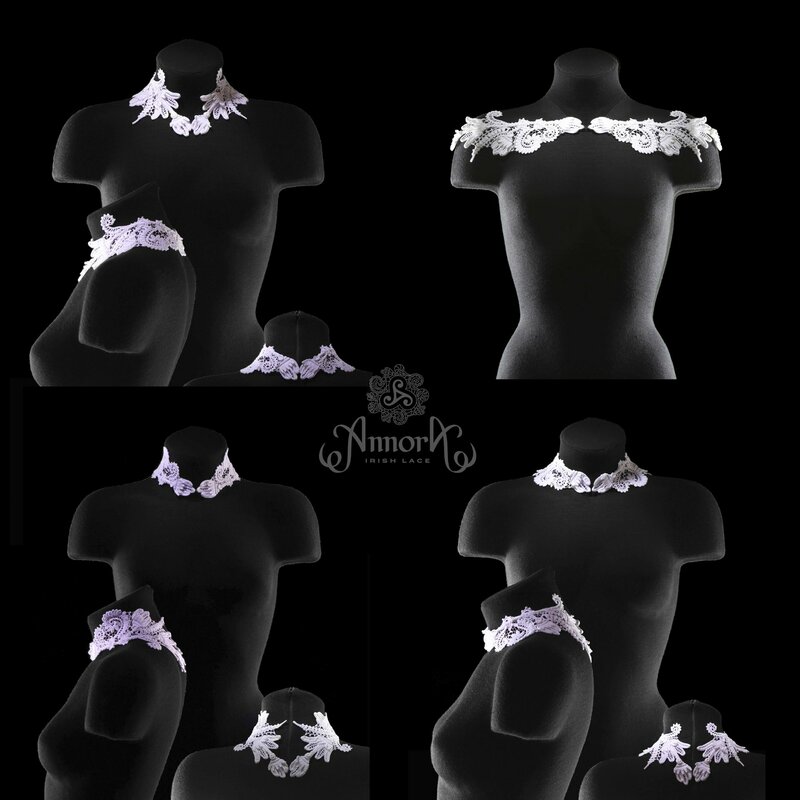 Set includes Grape-collar and Vine-cuffs which can be used as a collar. 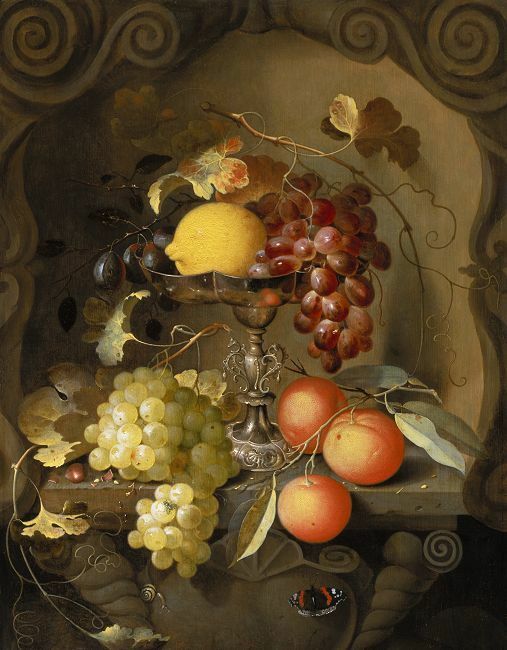 An exquisite set with bunches of grapes, an ancient symbol of fertility, sufficiency, richness and vitality. 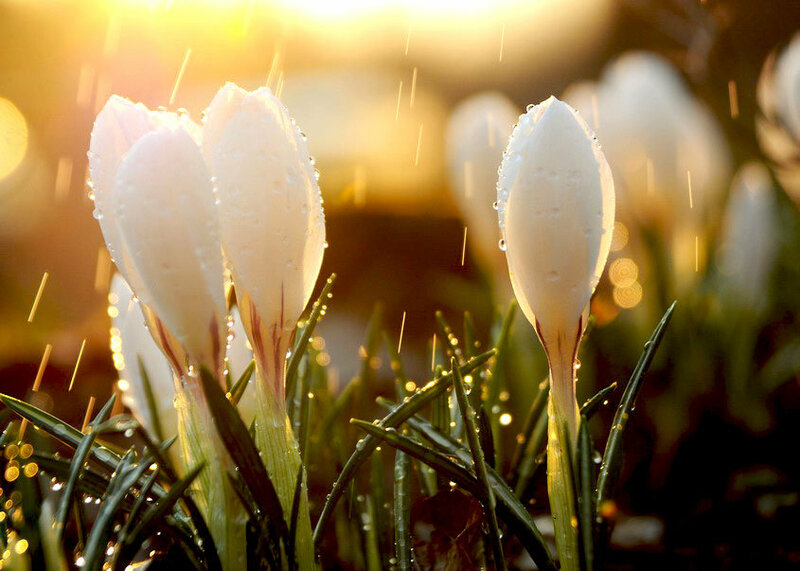 suit refined natures with a delicate taste. 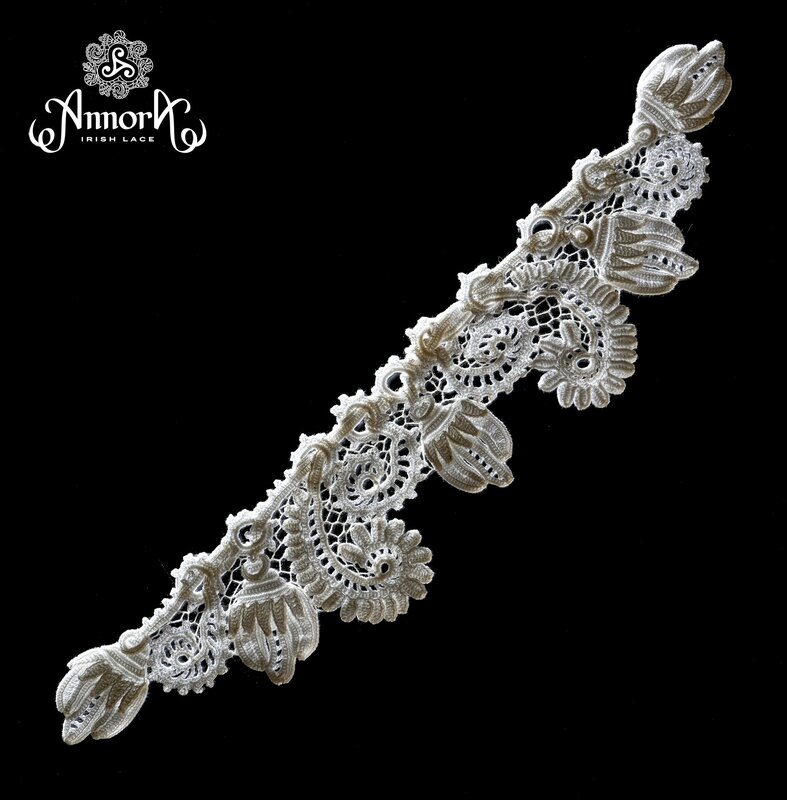 Collar - 30.5 x 7 cm at the widest lace part. 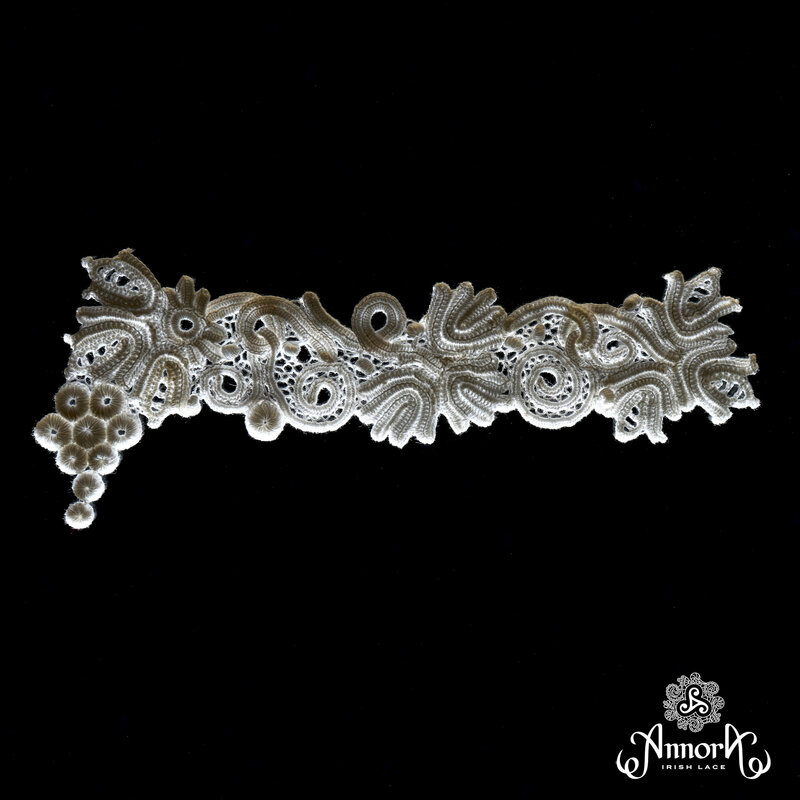 Cuffs - 17cm x 6 cm at the widest lace part. 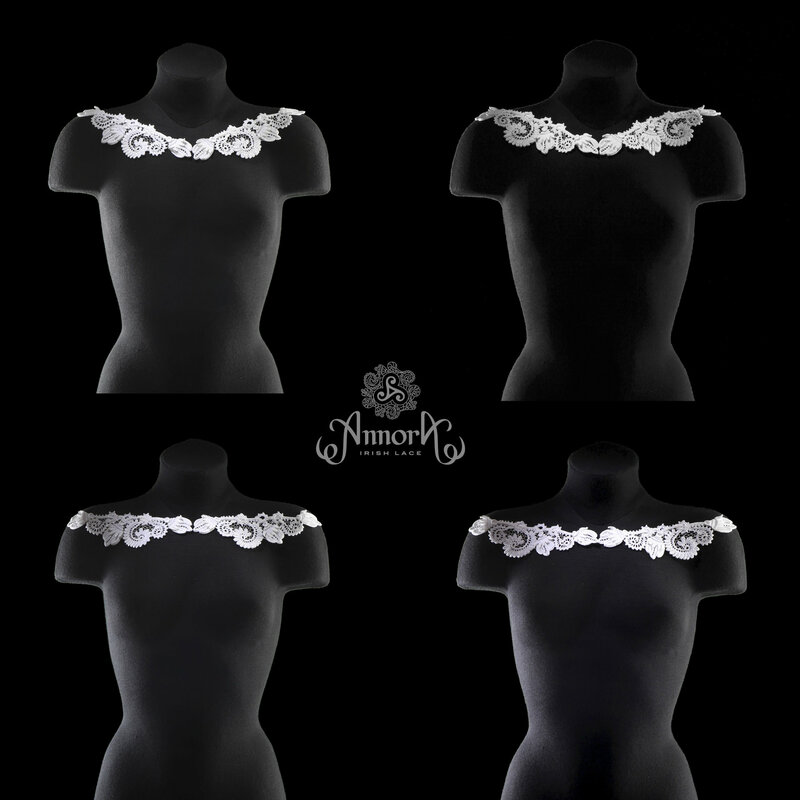 2 deep V-neck options, 1 collar options for a Victoria-neckline or not-deep V-neck, 1 boat shaped neck option, 2 jewelry neckline options and 1 stand collar option. 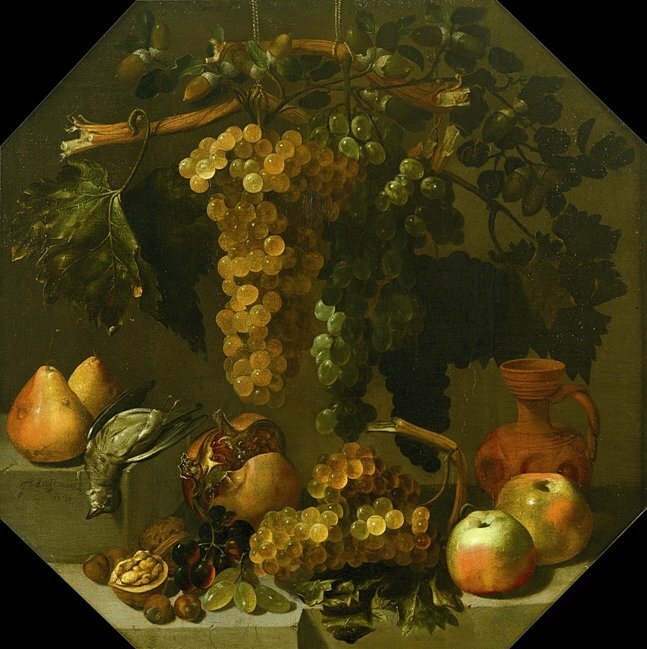 Set includes Grapes Viognier-collar and Grapes-cuffs which can be used as a collar. 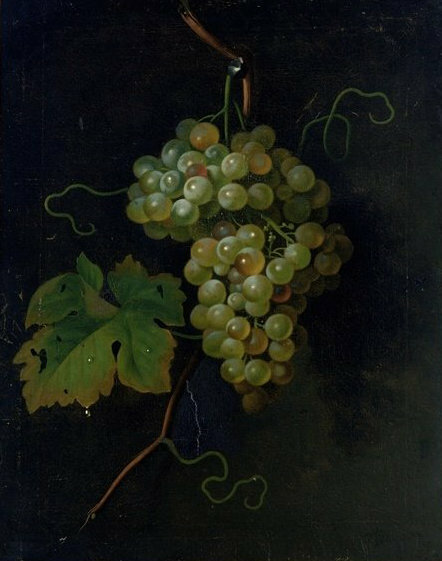 Viognier is a rare white grape variety used for production of fine wines. 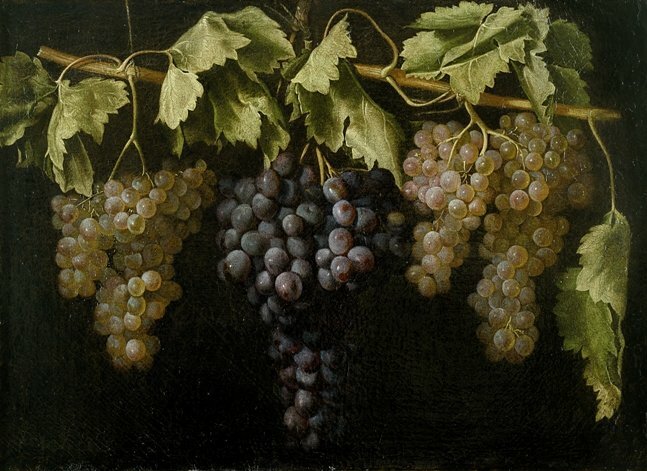 A bunches of grapes, an ancient symbol of fertility, sufficiency, richness and vitality. 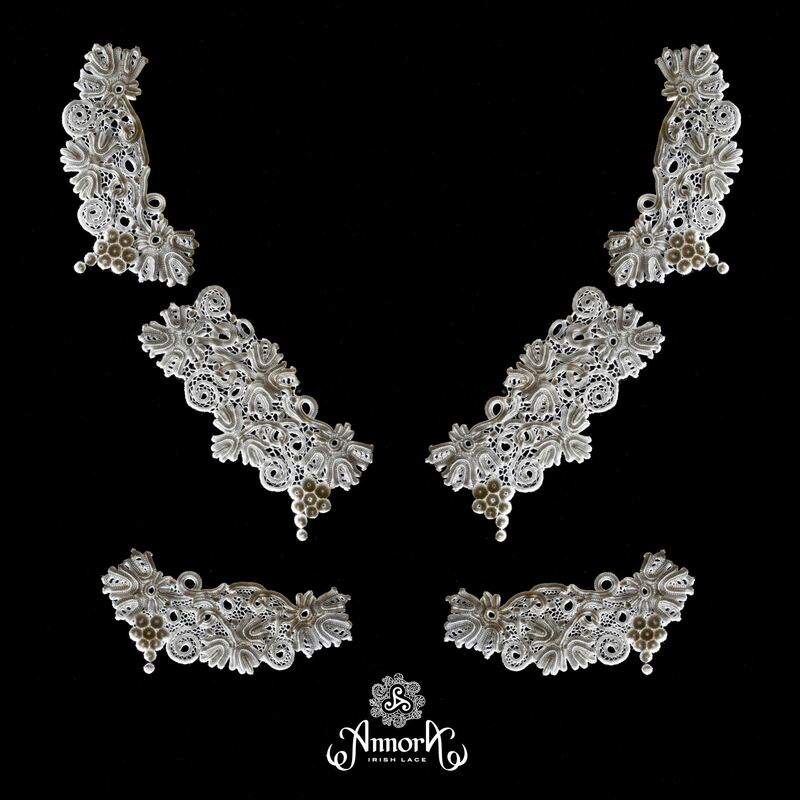 collar, 1st part - 17 cm x 8 cm at the widest lace part ( 8,5 cm part with grapes ). 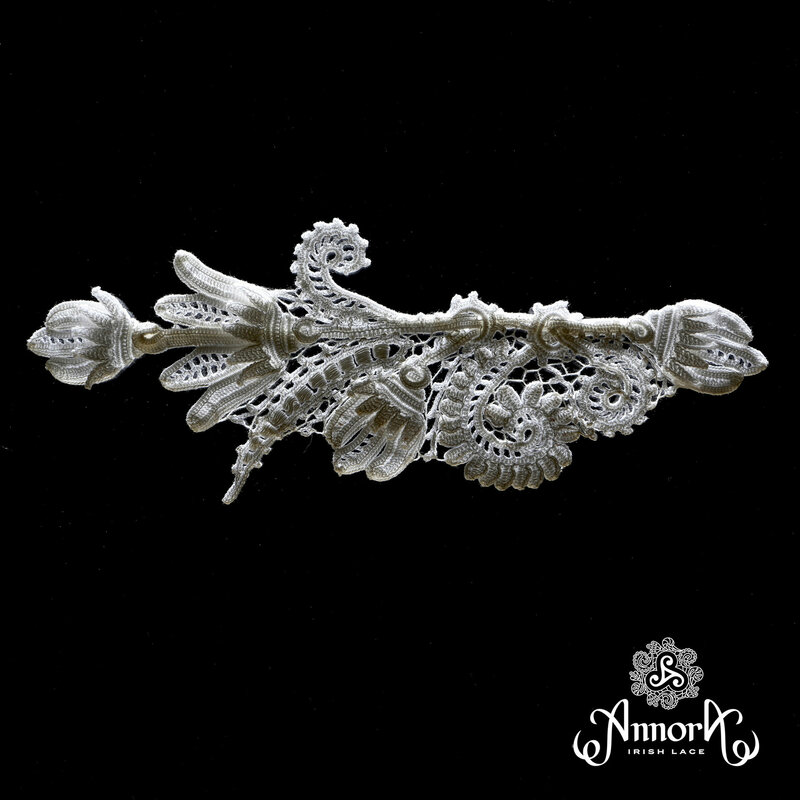 collar, 2nd part (pair) – 17 cm x 6 cm at the widest part ( 8,5 cm part with grapes ). 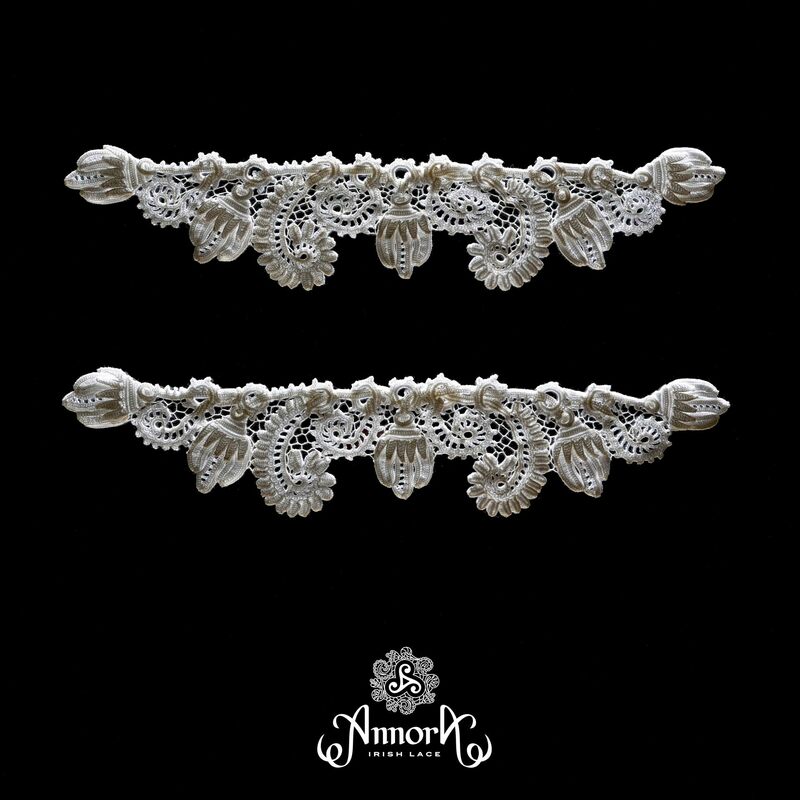 cuffs – 17cm x 6 cm at the widest lace part ( 8,5 cm part with grapes ). 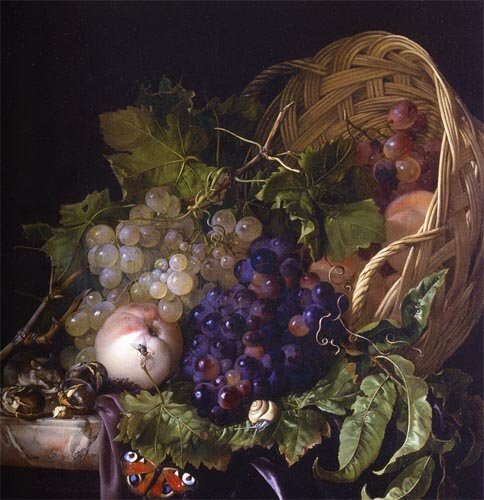 Set includes Grapes Montils-collar and Grapes-cuffs which can be used as a collar. 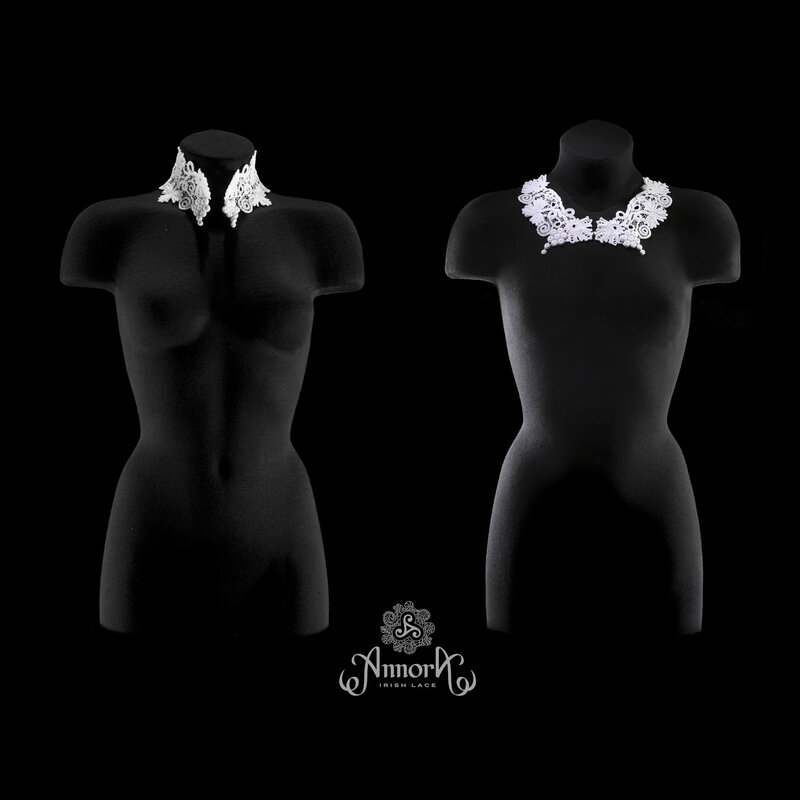 Two-pieced collar gives way to imagination in creating a great number of looks. 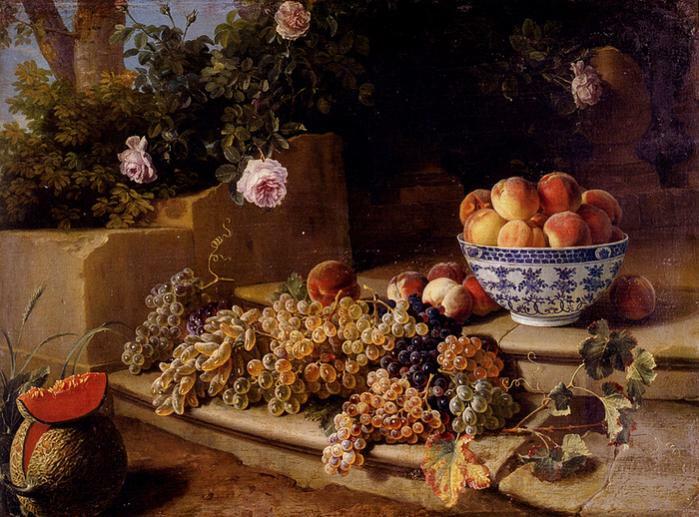 A bunches of grapes, an ancient symbol of fertility, sufficiency, richness and vitality. 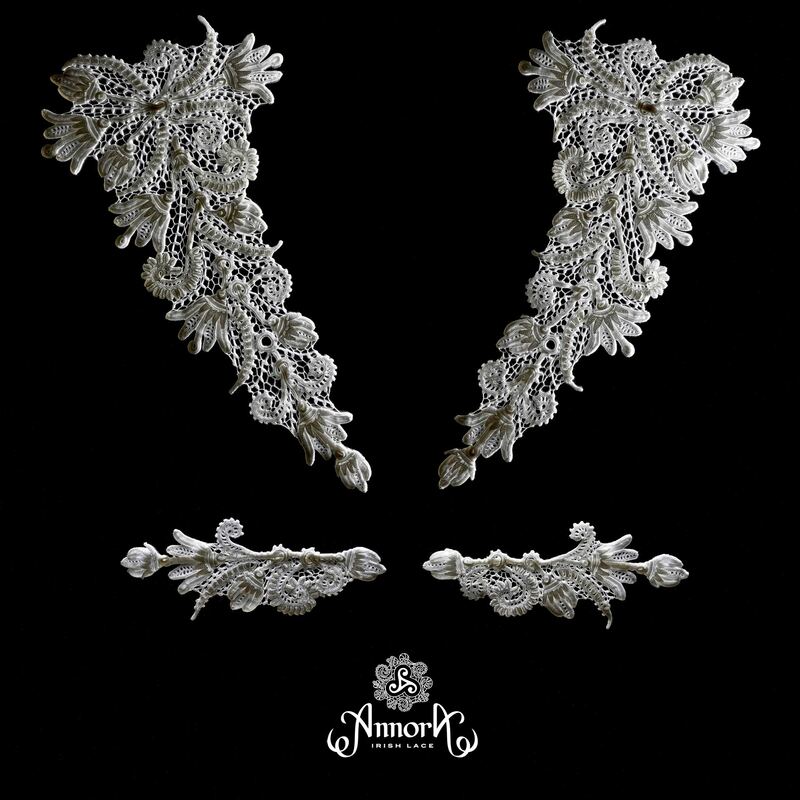 Collar - 44 cm x 21 cm at the widest lace part. 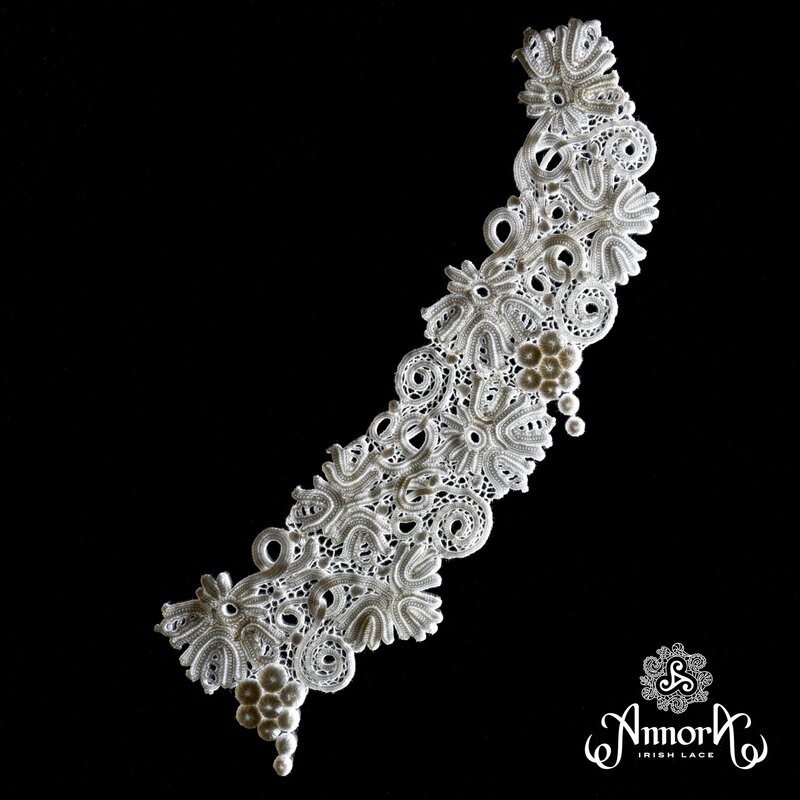 Cuffs – 25 cm x 10 cm at the widest lace part. 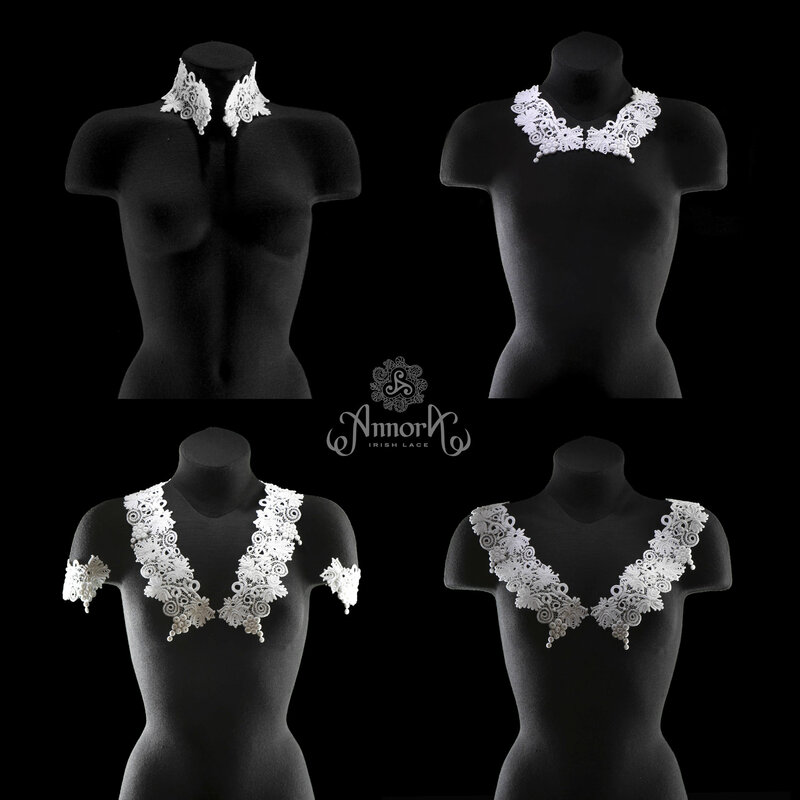 3 deep V-neck options , 3 collar options for a Victoria-neckline or not-deep V-neck, 1 boat shaped neck option, 3 options for stand collar. 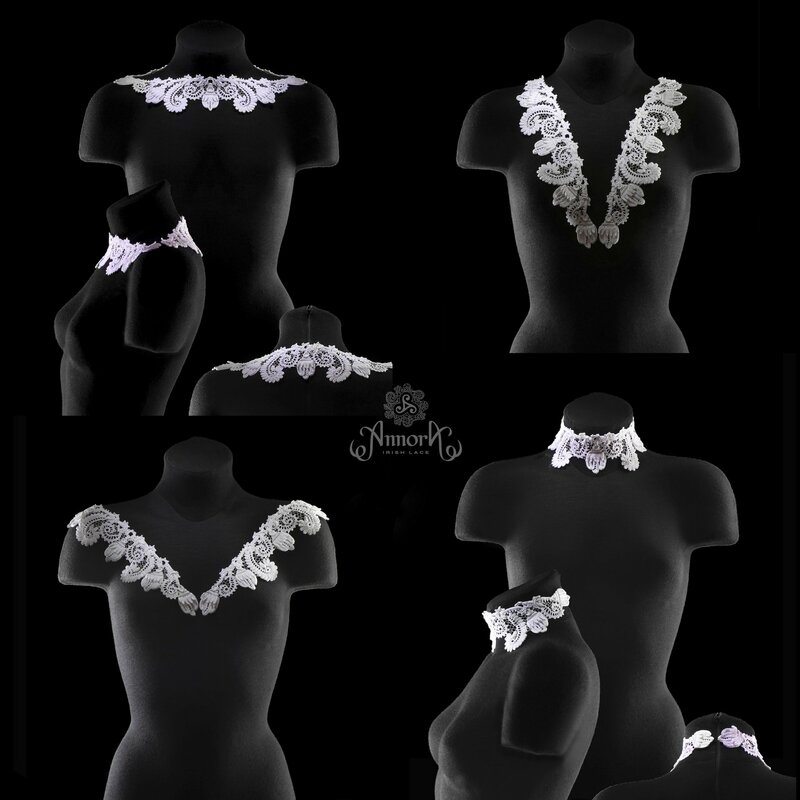 Set includes Berta-collar and Magnolias-cuffs which can be used as a collar.